The uprising against Syrian president Bashar al-Assad gradually turned into a full-scale civil war, with two significant milestones being the initial March 2011 Arab Spring protests and the 20 July 2006 declaration by the International Committee of the Red Cross that the fighting had gradually become so widespread that the situation should be regarded as a civil war. It has been 8 years, 1 month, 1 week and 2 days since the Syrian Day of Rage protests were staged on 15 March 2011. It has been 7 years, 6 months, 1 week and 2 days since the Red Cross declared the situation to be a civil war. Animation showing the changes in territorial control between october 2011 and march 2019. Major unrest began on 15 March 2011, when protesters marched in Damascus and Aleppo, demanding democratic reforms and the release of political prisoners, triggered by the arrest of a teenage boy and his friends a few days earlier in the city of Daraa, for writing in graffiti, "The people want the fall of the regime". Security forces retaliated by opening fire on the protesters, and according to witnesses who spoke to the BBC, the Ba'ath government forces detained six of them. Writer and analyst Louai al-Hussein, referencing the Arab Spring ongoing at that time, wrote that, "Syria is now on the map of countries in the region with an uprising". On 20 March, the protesters burned down a Ba'ath Party headquarters and "other buildings". The ensuing clashes claimed the lives of seven police officers and 15 protesters. Ten days later in a speech, President Bashar al-Assad blamed "foreign conspirators" pushing Israeli propaganda for the protests. Until 7 April, the protesters predominantly demanded democratic reforms, release of political prisoners, an increase in freedoms, abolition of the emergency law and an end to corruption. 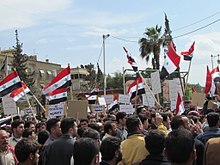 After 8 April, the emphasis in demonstration slogans shifted slowly towards a call to overthrow the Assad government. Protests spread; on Friday 8 April, they occurred simultaneously in ten cities. By Friday 22 April, protests were taking place in twenty cities. On 25 April, the Syrian Army initiated a series of large-scale deadly military attacks on towns with tanks, infantry carriers, and artillery, leading to hundreds of civilian deaths. By the end of May 2011, 1,000 civilians and 150 soldiers and policemen had been killed and thousands detained; among the arrested were many students, liberal activists and human rights advocates. Unverified reports claim that a portion of the security forces in Jisr al-Shugur defected after secret police and intelligence officers executed soldiers who had refused to fire on civilians. Later, more protesters in Syria took up arms, and more soldiers defected to protect protesters. Early insurgency phase of the Syrian Civil War lasted from late July 2011 to April 2012, and was associated with the rise of armed oppositional militias across Syria and the beginning of armed rebellion against the authorities of the Syrian Arab Republic. Though armed insurrection incidents began as early as June 2011 when rebels killed 120–140 Syrian security personnel, the beginning of organized insurgency is typically marked by the formation of the Free Syrian Army (FSA) on 29 July 2011, when a group of defected officers declared the establishment of the first organized oppositional military force. Composed of defected Syrian Armed Forces personnel, the rebel army aimed to remove Bashar al-Assad and his government from power. This period of the war saw the initial civil uprising take on many of the characteristics of a civil war, according to several outside observers, including the United Nations Commission on Human Rights, as armed elements became better organized and began carrying out successful attacks in retaliation for the crackdown by the Syrian Ba'athist government on demonstrators and defectors. The Arab League monitoring mission, initiated in December 2011, ended in failure by February 2012, as Syrian Ba'athist troops and oppositional militants continued to do battle across the country and the Syrian Ba'athist government prevented foreign observers from touring active battlefields, including besieged oppositional strongholds. In early 2012, Kofi Annan acted as the UN–Arab League Joint Special Representative for Syria and started negotiations for a peace plan, which included provision for a ceasefire. However, even as the negotiations for it were being conducted, the rebels and the Syrian army continued fighting. :11 Incommunicado detention, including of children, also continued. In April, Assad began employing attack helicopters against rebel forces. On 12 April, both sides, the Syrian Ba'athist Government and rebels of the FSA, entered a UN-mediated ceasefire period. It was a failure, with infractions of the ceasefire by both sides resulting in several dozen casualties. Acknowledging its failure, Annan called for Iran to be "part of the solution", though the country has been excluded from the Friends of Syria initiative. The peace plan practically collapsed by early June and the UN mission was withdrawn from Syria. Annan officially resigned in frustration on 2 August 2012. The 2012–13 escalation of the Syrian Civil War refers to the third phase of the war, which gradually escalated from the UN-mediated cease fire attempt during April–May 2012 and deteriorated into radical violence, escalating the conflict level to a fully fledged civil war. Following the Houla massacre of 25 May 2012, in which 108 people were summarily executed and the consequent FSA ultimatum to the Syrian Ba'athist government, the ceasefire practically collapsed, as the FSA began nationwide offensives against Assad government troops. On 1 June, President Assad vowed to crush the anti-government uprising. On 5 June, fighting broke out in Haffa and nearby villages in the coastal governorate of Latakia Governorate. Ba'ath Government forces were backed by helicopter gunships in the heaviest clashes in the governorate since the revolt began. Syrian forces seized the territory following days of fighting and shelling. On 6 June, 78 civilians were killed in the Al-Qubeir massacre. According to activist sources, Ba'ath government forces started by shelling the village before the Shabiha militia moved in. The UN observers headed to Al-Qubeir in the hope of investigating the alleged massacre, but they were met with a roadblock and small arms fire and were forced to retreat. On 12 June 2012, the UN for the first time officially proclaimed Syria to be in a state of civil war. The conflict began moving into the two largest cities, Damascus and Aleppo. In both cities, peaceful protests – including a general strike by Damascus shopkeepers and a small strike in Aleppo were interpreted as indicating that the historical alliance between the Ba'ath government and the business establishment in the large cities had become weak. On 22 June, a Turkish F-4 fighter jet was shot down by Syrian Ba'athist overnment forces, killing both pilots. Syria and Turkey disputed whether the jet had been flying in Syrian or international airspace when it was shot down. Despite Turkish Prime Minister Recep Tayyip Erdoğan's vows to retaliate harshly against Assad's government, no such intervention materialised. Bashar al-Assad publicly apologised for the incident. By 10 July, rebel forces had captured most of the city of Al-Qusayr, in Homs Governorate, after weeks of fighting. By mid-July, rebels had captured the town of Saraqeb, in Idlib Governorate. By mid-July 2012, with fighting spread across the country and 16,000 people killed, the International Committee of the Red Cross declared the conflict a civil war. Fighting in Damascus intensified, with a major rebel push to take the city. On 18 July, Syrian Defense Minister Dawoud Rajiha, former defense minister Hasan Turkmani, and the president's brother-in-law General Assef Shawkat were killed by a suicide bomb attack in Damascus. The Syrian intelligence chief Hisham Ikhtiyar, who was injured in the same explosion, later succumbed to his wounds. Both the FSA and Liwa al-Islam claimed responsibility for the assassination. In mid-July, rebel forces attacked Damascus and were repelled in two weeks, although fighting still continued in the outskirts. After this, the focus shifted to the battle for control of Aleppo. On 25 July, multiple sources reported that the Assad government was using fighter jets to attack rebel positions in Aleppo and Damascus, and on 1 August, UN observers in Syria witnessed Ba'athist government fighter jets firing on rebels in Aleppo. In early August, the Syrian Army recaptured Salaheddin district, an important rebel stronghold in Aleppo. In August, the Ba'athist government began using fixed-wing warplanes against the rebels. On 19 July, Iraqi officials reported that the FSA had gained control of all four border checkpoints between Syria and Iraq, increasing concerns for the safety of Iraqis trying to escape the violence in Syria. On 19 September, rebel forces seized a border crossing between Syria and Turkey in Raqqa Governorate. It was speculated that this crossing could provide opposition forces with strategic and logistical advantages due to Turkish support of the rebels, whose headquarters subsequently relocated from southern Turkey into northern Syria. On 6 September 2012 Kurdish activists reported that 21 civilians were killed in the Kurdish neighborhood of Sheikh Maqsud in Aleppo, when the Syrian Army shelled the local mosque and its surroundings. Despite the district being neutral during the Battle of Aleppo and free of Ba'athist government and FSA clashes, local residents believed that the district was shelled as retaliation for sheltering anti-government civilians from other parts of the city. In a statement released shortly after the deaths, the Kurdish People's Protection Units (YPG) vowed to retaliate. A few days later, Kurdish forces killed 3 soldiers in Afrin (Kurdish: Efrîn‎) and captured a number of other Ba'athist government soldiers in Ayn al-Arab (Kurdish: Kobanî‎) and Al-Malikiyah (Kurdish: Dêrika Hemko‎) from where they drove the remaining Ba'athist government security forces. It was also reported that the Ba'athist government had begun to arm Arab tribes around Qamishli in preparation for a possible confrontation with Kurdish forces, who still did not completely control the city. At least 8 Ba'athist government soldiers were killed and 15 wounded by a car bomb in the al-Gharibi district of Qamishli on 30 September 2012. The explosion targeted the Political Security branch. In October, rebel forces seized control of Maarat al-Numan, a town in Idlib Governorate on the highway linking Damascus with Aleppo and captured Douma, marking increased influence in Rif Dimashq. Lakhdar Brahimi arranged for a ceasefire during Eid al-Adha in late October, but it quickly collapsed. After Brahimi's ceasefire agreement ended on 30 October, the Syrian military expanded its aerial bombing campaign in Damascus. A bombing of the Damascus district of Jobar was the first instance of a fighter jet being used to bomb Damascus. The following day, Gen. Abdullah Mahmud al-Khalidi, a Syrian Air Force commander, was assassinated by opposition gunmen in the Damascus district of Rukn al-Din. In early November 2012, rebels made significant gains in northern Syria. The rebel capture of Saraqib in Idlib Governorate, which lies on the M5 highway, further isolated Aleppo. Due to insufficient anti-aircraft weapons, rebel units attempted to nullify the Ba'athist government's air power by destroying landed helicopters and aircraft on air bases. On 3 November, rebels launched an attack on the Taftanaz air base. On 18 November, rebels took control of Base 46 in the Aleppo Governorate, one of the Syrian Army's largest bases in northern Syria, after weeks of intense fighting. Defected General Mohammed Ahmed al-Faj, who commanded the assault, stated that nearly 300 Syrian troops had been killed and 60 had been captured, with rebels seizing large amounts of heavy weapons, including tanks. On 22 November, rebels captured the Mayadin military base in the country's eastern Deir ez-Zor Governorate. Activists said this gave the rebels control of a large amount of territory east of the base, stretching to the Iraqi border. On 29 November, at approximately 10:26 UTC, the Syrian Internet and phone service was shut off for a two-day period. Syrian Ba'athist government sources denied responsibility and blamed the blackout on fiber optic lines near Damascus becoming exposed and damaged; Edward Snowden in August 2014 claimed that this Internet breakdown had been caused, though unintendedly, by hackers of the NSA during an operation to intercept Internet communication in Syria. In mid-December 2012, American officials said that the Syrian military had fired Scud ballistic missiles at rebel fighters inside Syria. Reportedly, six Scud missiles were fired at the Sheikh Suleiman base north of Aleppo, which rebel forces had occupied. It is unclear whether the Scuds hit the intended target. The Ba'athist government denied this claim. Later that month, a further Scud attack took place near Marea, a town north of Aleppo near the Turkish border. The missile appeared to have missed its target. That same month, the British Daily Telegraph reported that the FSA had now penetrated into Latakia Governorate's coast through Turkey. In late December, rebel forces pushed further into Damascus, taking control of the adjoining Yarmouk and Palestine refugee camps, pushing out pro-Ba'athist government Popular Front for the Liberation of Palestine-General Command fighters with the help of other factions. Rebel forces launched an offensive in Hama Governorate, later claiming to have forced army regulars to evacuate several towns and bases, and stating that "three-quarters of western rural Hama is under our control." Rebels also captured the town of Harem near the Turkish border in Idlib Governorate, after weeks of heavy fighting. On 11 January 2013, Islamist groups, including al-Nusra Front, took full control of the Taftanaz air base in the Idlib Governorate, after weeks of fighting. The air base was often used by the Syrian military to carry out helicopter raids and deliver supplies. The rebels claimed to have seized helicopters, tanks and multiple rocket launchers, before being forced to withdraw by a Ba'athist government counter-attack. The leader of the al-Nusra Front said the amount of weapons they took was a "game changer". On 11 February, Islamist rebels captured the town of Al-Thawrah in Raqqa Governorate and the nearby Tabqa Dam, Syria's largest dam and a key source of hydroelectricity. The next day, rebel forces took control of Jarrah air base, located 60 kilometres (37 mi) east of Aleppo. On 14 February, fighters from al-Nusra Front took control of Shadadeh, a town in Al-Hasakah Governorate near the Iraqi border. On 20 February, a car bomb exploded in Damascus near the Ba'ath Syrian Regional Branch headquarters, killing at least 53 people and injuring more than 235. None of the groups claimed responsibility. On 21 February, the FSA in Quasar began shelling Hezbollah positions in Lebanon. Prior to this, Hezbollah had been shelling villages near Quasar from within Lebanon. A 48-hour ultimatum was issued by a FSA commander on 20 February, warning the militant group to stop the attacks. On 2 March, intense clashes between rebels and the Syrian Army erupted in the city of Raqqa, with many reportedly killed on both sides. On the same day, Syrian troops regained several villages near Aleppo. By 3 March, rebels had overrun Raqqa's central prison, allowing them to free hundreds of prisoners, according to the SOHR. The SOHR also stated that rebel fighters were now in control of most of an Aleppo police academy in Khan al-Asal, and that over 200 rebels and Ba'athist government troops had been killed fighting for control of it. By 6 March, the rebels had captured the city of Raqqa, effectively making it the first provincial capital to be lost by the Assad government. Residents of Raqqa toppled a bronze statue of his late father Hafez al-Assad in the centre of the city. The rebels also seized two top Ba'athist government officials. On 18 March, the Syrian Air Force attacked rebel positions in Lebanon for the first time. The attack occurred at the Wadi al-Khayl Valley area, near the town of Arsal. On 21 March, a suspected suicide bombing in the Iman Mosque in Mazraa district killed as many as 41 people, including the pro-Assad Sunni cleric, Sheikh Mohammed al-Buti. On 23 March, several rebel groups seized the 38th division air defense base in southern Daraa Governorate near a highway linking Damascus to Jordan. On the next day, rebels captured a 25 km strip of land near the Jordanian border, which included the towns of Muzrib, Abdin, and the al-Rai military checkpoint. On 25 March, rebels launched one of their heaviest bombardments of Central Damascus since the revolt began. Mortars reached Umayyad Square, where the Ba'ath Party headquarters, Air Force Intelligence and state television are located. On 26 March, near the Syrian town of al-Qusayr, rebel commander Khaled al Hamad, who commands the Al Farooq al-Mustakilla Brigade and is also known by his nom de guerre Abu Sakkar, ate the heart and liver of a dead soldier and said "I swear to God, you soldiers of Bashar, you dogs, we will eat from your hearts and livers! O heroes of Bab Amr, you slaughter the Alawites and take out their hearts to eat them!" in an apparent attempt to increase sectarianism. Video of the event emerged two months later and resulted in considerable outrage, especially from Human Rights Watch which classified the incident as a war crime. According to the BBC, it was one of the most gruesome videos to emerge from the conflict to-date. On 29 March, rebels captured the town of Da'el after fierce fighting. The town is located in Daraa Governorate, along the highway connecting Damascus to Jordan. On 3 April, rebels captured a military base near the city of Daraa. In mid-January 2013, as clashes re-erupted between rebels and Kurdish forces in Ras al-Ayn, YPG forces moved to expel Ba'athist government forces from oil-rich areas in Hassakeh Province. Clashes broke out from 14 to 19 January between the army and YPG fighters in the Kurdish village of Gir Zîro (Tall Adas), near al-Maabadah (Kurdish: Girkê Legê‎), where an army battalion of around 200 soldiers had been blockaded since 9 January. YPG forces claimed to have expelled Ba'athist government after the clashes. One soldier was reportedly killed and another eight injured, while seven were captured (later released) and 27 defected. Fighting at the oil field near Gir Zîro ended on 21 January, when Ba'athist government forces withdrew after receiving no assistance from Damascus. In Rumeilan, directly west of al-Maabadah, another 200 soldiers had been surrounded by YPG forces, and 10 soldiers were reported to have defected. From 8 to 11 February, heavy clashes broke out between the YPG and Ba'athist government troops in the PYD/YPG-held district Ashrafiyah where, according to SOHR, at least 3 soldiers and 5 pro-Ba'athist government militiamen were killed. The fighting followed deadly shelling on 31 January on Ashrafiyah, in which 23 civilians were killed after FSA units moved into the Kurdish sector of Aleppo. According to its own reports, the YPG lost 7 of its members in the fighting, while also claiming that 48 soldiers were killed and 22 captured, and a further 70 injured. In early March, YPG forces established full control of oil fields and installations in north-east Syria after Ba'athist government forces posted there surrendered. Also, YPG assaulted Ba'athist government forces and took control of the towns of Tall ʿAdas, which is adjacent to Rumeilan oil fields, and Al-Qahtaniya (Kurdish: Tirbespî‎). On 17 April, Ba'athist government forces breached a six-month rebel blockade in Wadi al-Deif, near Idlib. Heavy fighting was reported around the town of Babuleen after Ba'athist government troops attempt to secure control of a main highway leading to Aleppo. The break in the siege also allowed Ba'athist government forces to resupply two major military bases in the region which had been relying on sporadic airdrops. On 18 April, the FSA took control of Al-Dab'a Air Base near the city of al-Qusayr. The base was being used primarily to garrison ground troops. Meanwhile, the Syrian Army re-captured the town of Abel. The SOHR said the loss of the town would hamper rebel movements between al-Qusayr and Homs city. The capture of the airport would have relieved the pressure on the rebels in the area, but their loss of Abel made the situation more complicated. The same day, rebels reportedly assassinated Ali Ballan, who was a Ba'athist government employee, in the Mazzeh district of Damascus. On 21 April, Ba'athist government forces captured the town of Jdaidet al-Fadl, near Damascus. In April, Ba'athist government and Hezbollah forces launched an offensive to capture areas near al-Qusayr. On 21 April, pro-Assad forces captured the towns of Burhaniya, Saqraja and al-Radwaniya near the Lebanese border. By this point, eight villages had fallen to the Ba'athist government offensive in the area. On 24 April, after five weeks of fighting, Ba'athist government troops re-took control of the town of Otaiba, east of Damascus, which had been serving as the main arms supply route from Jordan. Meanwhile, in the north of the country, rebels took control of a position on the edge of the strategic Mennagh Military airbase, on the outskirts of Aleppo. This allowed them to enter the airbase after months of besieging it. On 2 May, Ba'athist government forces captured the town of Qaysa in a push north from the city's airport. Troops also retook the Wadi al-Sayeh central district of Homs, driving a wedge between two rebel strongholds. SOHR reported a massacre of over 100 people by the Syrian Army in the coastal town of Al Bayda, Baniyas. However, this could not be independently verified due to movement restrictions on the ground. Yet the multiple video images that residents had recorded – particularly of small children, were so shocking that even some Ba'athist government supporters rejected Syrian television's official version of events, that the army had simply "crushed a number of terrorists." On 15 June, the Syrian Army captured the Damascus suburb of Ahmadiyeh near the city's airport, and on 22 June, captured the rebel stronghold town of Talkalakh. On 28 June, rebel forces captured a major military checkpoint in the city of Daraa. On 12 July FSA reported that one of its commanders, Kamal Hamami, had been killed by Islamists a day before. The rebels declared that the assassination by the Islamic State of Iraq and Levant, was tantamount to a declaration of war. On 17 July, FSA forces took control of most of the southern city of Nawa after seizing up to 40 army posts stationed in the city. On 18 July, Kurdish YPG forces secured control of the northern town of Ras al-Ain, after days of fighting with the al-Nusra Front. In the following three months, continued fighting between Kurdish and mainly jihadist rebel forces led to the capture of two dozen towns and villages in Hasakah Governorate by Kurdish fighters, while the Jihadists made limited gains in Aleppo and Raqqa governorates after they turned on the Kurdish rebel group Jabhat al-Akrad over its relationship with the YPG. In Aleppo Governorate, Islamists massacred the Kurds leading to a mass migration of civilians to the town of Afrin. On 22 July, FSA fighters seized control of the western Aleppo suburb of Khan al-Asal. The town was the last Ba'athist government stronghold in the western portion of Aleppo Governorate. On 25 July, the Syrian Army secured the town of al-Sukhnah, after expelling the al-Nusra Front. On 27 July, after weeks of fighting and bombardment in Homs, the Syrian Army captured the historic Khalid ibn al-Walid Mosque, and two days later, captured the district of Khaldiyeh. On 4 August, around 10 rebel brigades, launched a large-scale offensive on the Ba'athist government stronghold of Latakia Governorate. Initial attacks by 2,000 opposition members seized as many as 12 villages in the mountainous area. Between 4 and 5 August 20 rebels and 32 Ba'athist government soldiers and militiamen had been killed in the clashes. Hundreds of Alawite villagers fled to Latakia. By 5 August, rebel fighters advanced to 20 kilometers from Qardaha, the home town of the Assad family. However, in mid-August, the military counter-attacked and recaptured all of the territory previously lost to the rebels in the coastal region during the offensive. A Syrian security force source "told AFP the army still had to recapture the Salma region, a strategic area along the border with Turkey." According to a Human Rights Watch report 190 civilians were killed by rebel forces during the offensive, including at least 67 being executed. Another 200 civilians, primarily women and children, were taken hostage. On 6 August, rebels captured Menagh Military Airbase after a 10-month siege. The strategic airbase is located on the road between Aleppo city and the Turkish border. On 21 August, a chemical attack took place in the Ghouta region of the Damascus countryside, leading to thousands of casualties and several hundred dead in the opposition-held stronghold. The attack was followed by a military offensive by Ba'athist government forces into the area, which had been hotbeds of the opposition. On 24 August, rebels captured the town of Ariha. However, Ba'athist government forces recaptured Ariha on 3 September. On 26 August, rebel forces took over the town of Khanasir in Aleppo Governorate which was the Ba'athist government's last supply route for the city of Aleppo. On 8 September, rebels led by the al-Nusra Front captured the Christian town of Maaloula, 43 km north of Damascus, The Syrian Army launched a counterattack a few days later, recapturing the town. On 28 September, rebels seized the Ramtha border post in Daraa Governorate on the Syria Jordan crossing after fighting which left 26 soldiers dead along with 7 foreign rebel fighters. On 3 October, AFP reported that Syria's army re-took the town of Khanasir, which is located on a supply route linking central Syria to the city of Aleppo. On 7 October, the Syrian Army managed to reopen the supply route between Aleppo and Khanasir. On 9 October, rebels seized the Hajanar guard post on the Jordanian border after a month of fierce fighting. Rebels were now in control of a swath of territory along the border from outside of Daraa to the edge of Golan Heights. The same day, Hezbollah and Iraqi Shiite fighters, backed up by artillery, air-strikes and tanks, captured the town of Sheikh Omar, on the southern outskirts of Damascus. Two days later, they also captured the towns of al-Thiabiya and Husseiniya on the southern approaches to Damascus. The capture of the three towns strengthened the Ba'athist government hold on major supply lines and put more pressure on rebels under siege in the Eastern Ghouta area. On 14 October, SOHR reported that rebels captured the Resefa and Sinaa districts of Deir ez-Zor city, as well as Deir ez-Zor's military hospital. The Syrian Army along with its allies, Hezbollah and the al-Abas brigade, launched an offensive on Damascus and Aleppo. On 16 October, AFP reported that Syrian troops recaptured the town of Bweida, south of Damascus. On 17 October, the Syrian Ba'athist government's head of Military Intelligence in Deir ez-Zor Governorate, Jameh Jameh, was assassinated by rebels in Deir ez-Zor city. SOHR reported that he had been shot by a rebel sniper during a battle with rebel brigades. On 24 October, the Syrian Army retook control of the town of Hatetat al-Turkman, located southeast of Damascus, along the Damascus International Airport road. On 26 October, Kurdish rebel fighters seized control of the strategic Yarubiya border crossing between Syria and Iraq from al-Nusra in Al Hasakah Governorate. Elsewhere, in Daraa Governorate, rebel fighters captured the town of Tafas from Ba'athist government forces after weeks of clashes which left scores dead. On 1 November, the Syrian Army retook control of the key city of Al-Safira and the next day, the Syrian Army and its allies recaptured the village of Aziziyeh on the northern outskirts of Al-Safira. From early to mid-November, Syrian Army forces captured several towns south of Damascus, including Hejeira and Sbeineh. Ba'athist Government forces also recaptured the town of Tel Aran, southeast of Aleppo, and a military base near Aleppo's international airport. On 10 November, the Syrian Army had taken full control of "Base 80", near Aleppo's airport. According to the SOHR, 63 rebels, and 32 soldiers were killed during the battle. One other report put the number of rebels killed between 60 and 80. Army units were backed-up by Hezbollah fighters and pro-Ba'athist government militias during the assault. The following day, Ba'athist government forces secured most of the area around the airport. On 13 November, Ba'athist government forces captured most of Hejeira. Rebels retreated from Hejeira to Al-Hajar al-Aswad. However, their defenses in besieged districts closer to the heart of Damascus were still reportedly solid. On 15 November, the Syrian Army retook control of the city of Tell Hassel near Aleppo. On 18 November, the Syrian troops stormed the town of Babbila. On 19 November, Ba'athist government forces took full control of Qara. The same day, the Syrian Army captured al-Duwayrinah. On 23 November, al-Nusra Front and other Islamist rebels captured the al-Omar oil field, Syria's largest oil field, in Deir al-Zor Governorate causing the Ba'athist government to rely almost entirely on imported oil. On 24 November, rebels captured the towns of Bahariya, Qasimiya, Abbadah, and Deir Salman in Damascus's countryside. On 28 November, the Syrian Army recaptured Deir Attiyeh. On 2 December, rebels led by the Free Syrian Army recaptured the historic Christian town of Ma'loula. After the fighting, reports emerged that 12 nuns had been abducted by the rebels. However, the FSA disputes this and said that the nuns had been evacuated to the nearby rebel held town of Yabrud due to the Army shelling. In early December, the Islamic Front seized control of Bab al-Hawa border crossing with Turkey, which had been in hands of FSA. The groups also captured warehouses containing equipment delivered by the U.S. In response, the U.S. and Britain said they halted all non-lethal aid to the FSA, fearing that further supplies could fall in hands of al-Qaeda militants. On 9 December, the Army took full control of Nabek, with fighting continuing in its outskirts. Tension between moderate rebel forces and ISIL had been high since ISIL captured the border town of Azaz from FSA forces on 18 September 2013. Conflict was renewed over Azaz in early October and in late November ISIL captured the border town of Atme from an FSA brigade. On 3 January 2014, the Army of the Mujahideen, the Free Syrian Army and the Islamic Front launched an offensive against ISIL in Aleppo and Idlib governorates. A spokesman for the rebels said that rebels attacked ISIL in up to 80% of all ISIL-held villages in Idlib and 65% of those in Aleppo. By 6 January, opposition rebels managed to expel ISIL forces from the city of Raqqa, ISIL's largest stronghold and capital of the Raqqa Governorate. On 8 January, opposition rebels expelled most ISIL forces from the city of Aleppo, however ISIL reinforcements from the Deir ez-Zor Governorate managed to retake several neighborhoods of the city of Raqqa. By mid January ISIL had retaken the entire city of Raqqa, while rebels expelled ISIL fighters fully from Aleppo city and the villages west of it. On 29 January, Turkish aircraft near the border fired on an ISIL convoy inside the Aleppo province of Syria, killing 11 ISIL fighters and an ISIL emir. In late January it was confirmed that rebels had assassinated ISIL's second in command, Haji Bakr, who was al-Qaeda's military council head and a former military officer in Saddam Hussein's army. By mid-February, the al-Nusra Front joined the battle in support of rebel forces, and expelled ISIL from the Deir Ezzor Governorate. By March, the ISIL forces fully retreated from the Idlib Governorate. On 4 March, ISIL retreated from the border town of Azaz and other nearby villages, choosing instead to consolidate around Raqqa in an anticipation of an escalation of fighting with al-Nusra. On 4 March, the Syrian Army took control of Sahel in the Qalamoun region. On 8 March, Ba'athist government forces took over Zara, in Homs Governorate, further blocking rebel supply routes from Lebanon. On 11 March, Ba'athist Government forces and Hezbollah took control of the Rima Farms region, directly facing Yabrud. On 16 March, Hezbollah and Ba'athist government forces captured Yabrud, after Free Syrian Army fighters made an unexpected withdrawal, leaving the al-Nusra Front to fight in the city on its own. On 18 March, Israel used artillery against a Syrian Army base, after four of its soldiers had been wounded by a roadside bomb while patrolling Golan Heights. On 19 March, the Syrian Army captured Ras al-Ain near Yabrud, after two days of fighting and al-Husn in Homs Governorate, while rebels in the Daraa Governorate captured Daraa prison, and freed hundreds of detainees. On 20 March, the Syrian Army took control of the Krak des Chevaliers in al-Husn. On 29 March, Syrian Army took control of the villages of Flitah and Ras Maara near the border with Lebanon. On 22 March, rebels took control of the Kesab border post in the Latakia Governorate. By 23 March, rebels had taken most of Khan Sheikhoun in Hama. During clashes near the rebel-controlled Kesab border post in Latakia, Hilal Al Assad, NDF leader in Latakia and one of Bashar Al Assad's cousins was killed by rebel fighters. On 4 April, rebels captured the town of Babulin, Idlib. On 9 April, the Syrian Army took control of Rankous in the Qalamoun region. On 12 April, rebels in Aleppo stormed the Ba'athist government-held Ramouseh industrial district in an attempt to cut the Army supply route between the airport and a large Army base. The rebels also took the Rashidin neighbourhood and parts of the Jamiat al-Zahra district. On 26 April, the Syrian Army took control of Al-Zabadani. According to SOHR, rebels took control of Tell Ahrmar, Quneitra. Rebels in Daraa also took over Brigade 61 Base and the 74th battalion. On 26 April, the FSA announced they had begun an offensive against ISIL in the Raqqa Governorate, and had seized five towns west of Raqqa city. On 29 April, activists said that the Syrian Army captured Tal Buraq near the town of Mashara in Quneitra without any clashes. On 7 May, a truce went into effect in the city of Homs, SOHR reported. The terms of the agreement include safe evacuation of Islamist fighters from the city, which would then fall under Ba'athist government control, in exchange for release of prisoners and safe passage of humanitarian aid for Nubul and Zahraa, two Shiite enclaves besieged by the rebels. On 18 May, the head of Syria's Air Defense, General Hussein Ishaq, died of wounds sustained during a rebel attack on an air defense base near Mleiha the previous day. In Hama Governorate, rebel forces took control of the town of Tel Malah, killing 34 pro-Assad fighters at an army post near the town. Its seizure marked the third time rebels have taken control of the town. Syria held a presidential election in Ba'athist government-held areas on 3 June 2014. For the first time in the history of Syria more than one person was allowed to stand as a presidential candidate. More than 9,000 polling stations were set up in Ba'athist government-held areas. According to the Supreme Constitutional Court of Syria, 11.63 million Syrians voted (the turnout was 73.42%). President Bashar al-Assad won the election with 88.7% of the votes. As for Assad's challengers, Hassan al-Nouri received 4.3% of the votes and Maher Hajjar received 3.2%. Allies of Assad from more than 30 countries were invited by the Syrian Ba'athist government to follow the presidential election, including Bolivia, Brazil, Cuba, Ecuador, India, Iran, Iraq, Nicaragua, Russia, South Africa and Venezuela. The Iranian official Alaeddin Boroujerdi read a statement by the group saying the election was "free, fair and transparent". The Gulf Cooperation Council, the European Union and the United States all dismissed the election as illegitimate and a farce. State employees were told to vote or face interrogation. On the ground there were no independent monitors stationed at the polling stations. It is claimed in an opinion piece that as few as 6 million eligible voters remained in Syria. Due to rebel, Kurdish and ISIL control of Syrian territories there was no voting in roughly 60% of the country. Starting on 5 June, ISIL seized swathes of territory in Iraq in addition to heavy weapons and equipment from the Iraqi Army, some of which they brought into Syria. Ba'athist Government airstrikes targeted ISIL bases in Raqqa and Al-Hasakah in coordination with an Iraqi Army counteroffensive. On 14 June, Ba'athist government forces retook the town of Kessab in northern Latakia Governorate, while rebels took over Tall al-Gomo near the town of Nawa in the Daraa Governorate, as well as reentering the Qalamoun area. According to the Syrian Observatory for Human Rights, on 17 July ISIL took control of the Shaar oil field, killing 90 pro-Ba'athist government forces while losing 21 fighters. In addition, 270 guards and Ba'athist government-aligned fighters were missing. About 30 Ba'athist government persons managed to escape to the nearby Hajjar field. On 20 July, the Syrian Army secured the field, although fighting continued in its outskirts. On 25 July, the Islamic State took control of the Division 17 base near Raqqa. On 7 August, ISIL took the Brigade 93 base in Raqqa using weapons captured from their offensive in Iraq. Multiple suicide bombs also went off before the base was stormed. On 13 August, ISIL forces took the towns of Akhtarin and Turkmanbareh from rebels in Aleppo. ISIL forces also took a handful of nearby villages. The other towns seized include Masoudiyeh, Dabiq and Ghouz. On 14 August, the Free Syrian Army commander Sharif As-Safouri admitted working with Israel and receiving anti-tank weapons from Israel and FSA soldiers also received medical treatment inside Israel. On 14 August, the Syrian Army as well as Hezbollah militias retook the town of Mleiha in Rif Dimashq Governorate. The Supreme Military Council of the FSA denied claims of Mleiha's seizure, rather the rebels have redeployed from recent advances to other defensive lines. Mleiha has been held by the Islamic Front. Rebels had used the town to fire mortars on Ba'athist government held areas inside Damascus. Meanwhile, ISIL forces in Raqqa were launching a siege on Tabqa airbase, the Syrian Ba'athist government's last military base in Raqqa. Kuwaires airbase in Aleppo also came under fierce attack by ISIL. On 16 August, there were reports that 22 people were killed in the village of Daraa by a car bomb outside a mosque. The bomb was thought to be detonated by ISIL. Also on 16 August, the Islamic State seized the village of Beden in Aleppo Governorate from rebels. On 19 August, American journalist James Foley was executed by ISIL, who claimed it was in retaliation for the United States operations in Iraq. Foley was kidnapped in Syria in November 2012 by Shabiha militia. ISIL also threatened to execute Steven Sotloff, who was kidnapped at the Syrian-Turkish border in August 2013. There were reports ISIL captured a Japanese national, two Italian nationals, and a Danish national as well. At least 70 journalists have been killed covering the Syrian war, and more than 80 kidnapped, according to the Committee to Protect Journalists. On 23 August, the Tabqa airbase was no longer encircled by ISIL fighters and the Syrian Army had taken back the M-42 Highway from ISIL fighters, which leads to the city of Salamiyah in the Hama Governorate. Also in Raqqa, the Syrian Army took control of the town of Al-Ejeil. ISIL reportedly sent reinforcements from Iraq to the governorate of Raqqa. The Syrian Observatory for Human Rights said at least 400 ISIL fighters had also been wounded in the previous five days in clashes with the Syrian Army and National Defence Force in Raqqa alone. At the same time, several senior UK and US figures urged Turkey to stop allowing ISIL to cross the border to Syria and Iraq. It was around this time that the Americans realized that the Turks had no intention of sealing their side of the border, and so Washington decided to work with the Syrian Kurds to close off the border on the Syrian side. A year later, with the Kurds in control of most of the Turkey–Syria border, and the Syrian army advancing under Russian air support to seal the remainder, the situation was causing great ructions in Ankara. On the following day, the Islamic State seized Tabqa airbase from Ba'athist government forces. The battle for the base left 346 ISIL fighters and 195 soldiers dead. Prisoners taken by ISIL forces were executed and a video from the mass killing was posted on YouTube. The death toll varied from 120 to 250. On 26 August, the Syrian Air Force carried out airstrikes against ISIL targets in the Governorate of Deir ez-Zor (for its oil and natural gas resources as well as strategically splitting ISIL territories). This was the first time the Syrian Army had attacked them in Deir ez-Zor, as the Syrian Army pulled out of Raqqa and shifted to Deir ez-Zor in a bid to seize its oil and natural gas resources as well as strategically splitting ISIL territories. American jets began bombing ISIL in Syria on 23 September 2014, raising U.S. involvement in the war-torn country. At least 20 targets in and around Raqqa were hit, the opposition group Syrian Observatory for Human Rights said. Foreign partners participating in the strikes with the United States were Bahrain, Saudi Arabia, the United Arab Emirates, Qatar and Jordan. The U.S. and "partner nation forces" began striking ISIL targets using fighters, bombers and Tomahawk missiles, Pentagon spokesman Rear Adm. John Kirby said. U.S. aircraft include B-1 bombers, F-16s, F-18s and Predator drones, with F-18s flying missions off the USS George H.W. Bush (CVN-77) in the Persian Gulf. Tomahawk missiles were fired from the destroyer USS Arleigh Burke (DDG-51) in the Red Sea. Syria's Foreign Ministry told the Associated Press that the U.S. informed Syria's envoy to the U.N. that "strikes will be launched against the terrorist group in Raqqa". The United States informed the Free Syrian Army beforehand of the impending airstrikes, and the rebels said that weapons transfers to the Free Syrian Army had begun. The United States also attacked a specific faction of al-Nusra called the Khorasan Group, who according to the United States had training camps and plans for attacking the United States in the future. For its part, Turkey launched an official request to the U.N. for a no-fly zone over Syria. The same day, Israel shot down a Syrian warplane after it entered the Golan area from Quneitra. By 3 October, ISIL forces were heavily shelling the city of Kobanî and were within a kilometre of the town. In February 2014, the Southern Front of the Free Syrian Army formed in southern Syria. Six months later, they started a string of victories in Daraa and Quneitra during the 2014 Quneitra offensive, the Daraa offensive, the Battle of Al-Shaykh Maskin, the Battle of Bosra (2015) and the Battle of Nasib Border Crossing. A Ba'athist government counter-offensive (the 2015 Southern Syria offensive) during this period, that included the IRGC and Hezbollah, recaptured 15 towns, villages and hills, but the operation slowed soon after and stalled. From early 2015, opposition military operations rooms based in Jordan and Turkey began increasing cooperation, with Saudi Arabia and Qatar also reportedly agreeing upon the necessity to unite opposition factions against the Syrian Ba'athist government. In late October 2014, a conflict erupted between the al-Nusra Front on one side and the western-backed SRF and Hazzm Movement on the other (Al-Nusra Front–SRF/Hazzm Movement conflict). ISIL reportedly reinforced al-Nusra. By the end of February 2015 al-Nusra had defeated both groups, captured the entire Zawiya Mountain region in Idlib province and several towns and military bases in other governorates, and seized weapons supplied by the CIA to the two moderate groups. The significant amount of weapons seized included a small number of BGM-71 anti-tank missiles similar to weapons systems al-Nusra Front had previously captured from Ba'athist government stockpiles such as French MILANs, Chinese HJ-8s and Russian 9K111 Fagots. Reuters reported that this represented al-Nusra crushing pro-Western rebels in the north of the country. According to FSA commanders in northern Syria, however, the elimination of Harakat Hazm and the SRF was a welcome development due to the leaders of those factions allegedly involved in corruption. The Western-backed 30th Division of the FSA remained active elsewhere in Idlib. By 24 March 2015 the al-Nusra Front dominated most of Idlib province, except for the Ba'athist government-held provincial capital, Idlib, which they had encircled on three sides along with its Islamist allies. On 28 March a joint coalition of Islamist forces, the Army of Conquest, captured Idlib. This left the north largely taken over by Ahrar ash-Sham, al-Nusra Front and other Islamist rebels, with the south of the country becoming the last significant foothold for the mainstream, non-jihadist opposition fighters. On 22 April, a new rebel offensive was launched in the north-west of Syria and by 25 April, the rebel coalition Army of Conquest had captured the city of Jisr al-Shughur. At the end of the following month, the rebels also seized the Al-Mastumah military base, and Ariha, leaving Ba'athist government forces in control of tiny pockets of Idlib, including the Abu Dhuhur military airport. In addition, according to the Brookings Doha Center, the Army of Conquest coalition was a broad opposition effort to ensure that the Al-Qaeda-affiliated al-Nusra Front was contained, with the rearguard involvement of Western-backed factions being regarded as crucial. Still, according to some, the FSA in northern Syria had by this point all but dissipated. Many of the moderate fighters joined more extremist organizations, such as Ahrar ash-Sham, the largest faction in the Army of Conquest, which led to the subsequent rise of the Islamist Army of Conquest coalition. Rebel advances led to Ba'athist government and Hezbollah morale plunging dramatically. In north-west Syria these losses were countered by a Hezbollah-led offensive in the Qalamoun mountains north of Damascus, on the border with Lebanon, that gave Hezbollah effective control of the entire area. On 21 May, ISIL took control of Palmyra, a UNESCO World Heritage Site, after eight days of fighting. The jihadists also captured the nearby towns of Al-Sukhnah and Amiriya, as well as several oil fields. Following the capture of Palmyra, ISIL conducted mass executions in the area, killing an estimated 217–329 Ba'athist government civilian supporters and soldiers, according to opposition activists. Ba'athist Government sources put the number of killed at 400–450. By early June, ISIL reached the town of Hassia, which lies on the main road from Damascus to Homs and Latakia, and reportedly took up positions to the west of it, creating a potential disaster for the Ba'athist government and raising the threat of Lebanon being sucked further into the war. On 25 June, ISIL launched two offensives. One was a surprise diversionary attack on Kobanî, while the second targeted Ba'athist government-held parts of Al-Hasakah city. The ISIL offensive on Al-Hasakah displaced 60,000 people, with the UN estimating a total of 200,000 would be displaced. In July 2015, a raid by U.S. special forces on a compound housing the Islamic State's "chief financial officer", Abu Sayyaf, produced evidence that Turkish officials directly dealt with ranking ISIS members. ISIL captured Al-Qaryatayn from the Ba'athist government on 5 August 2015. Australia joined the bombing of ISIL in Syria in mid September, an extension of their efforts in Iraq for the past year. On 30 September 2015, at an official request by the Syrian Ba'athist government headed by President Bashar al-Assad, the Russian Aerospace Forces began a sustained campaign of air strikes against both ISIL and the anti-Assad FSA. Initially, the raids were conducted solely by Russian aircraft stationed in the Khmeimim base in Syria. Shortly after the start of the Russian operation, U.S. president Barack Obama was reported to have authorized the resupply of Syrian Kurds and the Arab-Syrian opposition, Obama reportedly emphasizing to his team that the U.S. would continue to support the Syrian opposition now that Russia had joined the conflict. On 7 October 2015, Russian officials said the ships of the Caspian Flotilla had earlier that day fired 26 sea-based cruise missiles at 11 ISIL targets in Syria destroying those and causing no civilian casualties. On the same day, the Syrian Ba'athist government′s ground forces launched the Northwestern Syria ground offensive that in the following few days succeeded in recapturing some territory in northern Hama Governorate, close to the Ba'athist government's coastal heartland in the west of the country. Two weeks after the start of the Russian campaign in Syria, The New York Times opined that with anti-Ba'athist government commanders receiving for the first time bountiful supplies of U.S.-made anti-tank missiles and with Russia raising the number of airstrikes against the Ba'athist government’s opponents that had raised morale in both camps, broadening war objectives and hardening political positions, the conflict was turning into an all-out proxy war between the U.S. and Russia. Despite multiple top-ranking casualties incurred by the Iranian forces advising fighters in Syria, in mid-October the Russian-Syrian-Iranian-Hezbollah offensive targeting rebels in Aleppo went ahead. At the end of October 2015, the U.S. Secretary of Defense Ashton Carter signalled a shift in the strategy of the U.S.-led campaign saying there will be more air strikes and ruling in the use of direct ground raids, the fight in Syria concentrating mostly on Raqqa. On 30 October and two weeks later, Syria peace talks were held in Vienna, initiated by the United States, Russia, Turkey and Saudi Arabia, in which on 30 October Iran participated for the first time in negotiations on Syrian settlement. The participants disagreed on the future of Bashar Assad. On 10 November 2015, the Syrian Ba'athist government forces completed the operation to break through the ISIL insurgents′ blockade of the Kweires air base in Aleppo Province, where Ba'athist government forces had been under siege since April 2013. In mid-November 2015, in the wake of the Russian plane bombing over Sinai and the Paris attacks, both Russia and France significantly intensified their strikes in Syria, France closely coordinating with the U.S. military. On 17 November, Putin said he had issued orders for the cruiser Moskva that had been in eastern Mediterranean since the start of the Russian operations to "work as with an ally", with the French naval group led by flagship Charles De Gaulle then on her way to the eastern Mediterranean. Shortly afterwards, a Russian foreign ministry official criticised France′s stridently anti-Assad stance as well as France′s air strikes at oil and gas installations in Syria as apparently designed to prevent those from returning under the Syrian Ba'athist government′s control; the Russian official pointed out that such strikes by France could not be justified as they were carried out without the Syrian Ba'athist government′s consent. In his remarks to a French delegation that included French parliamentarians, on 14 November, President Bashar Assad sharply criticised France′s as well as other Western States′ actions against the Syrian Ba'athist government suggesting that French support for Syrian opposition forces had led to the Islamic State-claimed attacks in Paris. On 19 November 2015, U.S. President Barack Obama, speaking of the Vienna process, said he was unable to "foresee a situation in which we can end the civil war in Syria while Assad remains in power" and urged Russia and Iran to stop supporting the Syrian Ba'athist government. On 20 November 2015, the UN Security Council, while failing to invoke the UN's Chapter VII, which gives specific legal authorisation for the use of force, unanimously passed Resolution 2249 that urged UN members to "redouble and coordinate their efforts to prevent and suppress terrorist acts committed specifically by ISIL...as well as...all other...entities associated with Al-Qaida, and other terrorist groups, as designated by the United Nations Security Council, and as may further be agreed by the International Syria Support Group (ISSG) and endorsed by the UN Security Council". The adopted resolution was drafted by France and co-sponsored by the UK the following day after Russia introduced an updated version of its previously submitted draft resolution that was blocked by the Western powers as seeking to legitimise Assad’s authority. On 24 November 2015, Turkey shot down a Russian warplane that allegedly violated Turkish airspace and crashed in northwestern Syria, leading to the Russian pilot's death. Following the crash, it was reported that Syrian Turkmen rebels from Syrian Turkmen Brigades attacked and shot down a Russian rescue helicopter, killing a Russian naval infantryman. A few days later, Russian aircraft were reported to have struck targets in the Syrian town of Ariha in Idlib province that was controlled by the Army of Conquest causing multiple casualties on the ground. On 2 December 2015, the Parliament of the United Kingdom voted to expand Operation Shader into Syria with a majority of 397–223. That day, two British Tornado aircraft took off from RAF Akrotiri immediately at 22:30, each carrying three Paveway bombs. Two further aircraft were deployed at 00:30 on 3 December, and all aircraft returned by 06:30 without their bombs. Defence Secretary Michael Fallon said that the strikes hit the Omar oil fields in eastern Syria, and that eight more jets (two Tornados and six Typhoons) were being sent to RAF Akrotiri to join the eight already there. On 7 December 2015, the Ba'athist government of Syria announced that US-led coalition warplanes had fired nine missiles at its army camp near Ayyash, Deir al-Zour province, on the evening prior, killing three soldiers and wounding 13 others; three armoured vehicles, four military vehicles, heavy machine-guns and an arms and ammunition depot were also destroyed. The Ba'athist government condemned the strikes, the first time the Ba'athist government forces would be struck by the coalition, as an act of "flagrant aggression"; the coalition spokesman denied it was responsible. Anonymous Pentagon officials alleged later in the day that the Pentagon was "certain" that a Russian warplane (presumably a TU-22 bomber) had carried out the attack. The claim was denied by the Russian military spokesman who noted that four Western coalition warplanes (other than U.S.) had been spotted over the Deir az-Zor area in Syria on 6 December. On 14 December 2015, Russia's government news media reported that the Syrian Ba'athist government forces retook a Marj al-Sultan military airbase east of Damascus that had been held by Jaysh al-Islam. The UN resolution 2254 of 18 December 2015 endorsed the ISSG′s transitional plan but did not clarify who would represent the Syrian opposition, while condemning terrorist groups like ISIL and al-Qaeda; it made no mention of the future role of Syrian President Bashar Assad. On 12 January 2016, the Syria Ba'athist government announced that its army and allied forces had established "full control" of the strategically situated town of Salma, a predominantly Sunni village in the mostly Alawite northwestern province of Latakia, and continued to advance north. On 16 January 2016, ISIL militants launched raid on Ba'athist government-held areas in the city of Deir ez-Zor and killed up to 300 people. Counter-strikes by Russian Air Force fighter jets, in support of Syrian army forces, were reported to take back the areas. On 21 January 2016, Russia′s activity presumably aimed at setting up a new base in the Ba'athist government-controlled Kamishly Airport was first reported; the northeastern town of Qamishli in the Al-Hasakah Governorate had been largely under the Syrian Kurds′ control since the start of the Syrian Kurdish–Islamist conflict in the governorate of Al-Hasakah in July 2013. Similar activity by the U.S. forces was suspected in the Rmelan Airbase in the same province, 50 km away from the Kamishly Airport; the area is likewise controlled by the US-backed Kurdish People's Protection Units (YPG). On 24 January 2016, the Syrian Ba'athist government announced its forces, carrying on with their Latakia offensive, had seized the predominantly Sunni-populated town of Rabia, the last major town held by rebels in western Latakia province; Russian forces were said to have played an important role in the recapture, which threatened rebel supply lines from Turkey. By 26 January 2016, the Syrian Ba'athist government established "full control" over the town of Al-Shaykh Maskin in the Daraa Governorate, thus completing the operation that had begun in late December 2015. Several analysts considered this a turning of the tide for the Syrian Ba'athist government, citing the significance of military help from Russia, Iran, and Hezbollah, considering that rebels had once controlled about 70% of the province. On 26 February 2016, the United Nations Security Council unanimously adopted resolution 2268 that endorsed a previously brokered U.S.-Russian deal on a "cessation of hostilities". The cease-fire started on 27 February 2016 at 00:00 (Damascus time). The ceasefire does not include attacks on UN-designated terrorist organizations. At the close of February 2016, despite individual clashes, the truce was reported to hold. By the end of March, the Syrian Ba'athist government forces with support from Russia and Iran successfully captured Palmyra from the ISIL. By early July 2016, the truce was said to have mostly unravelled, violence again escalated, and the fighting between all the major parties to the conflict continued. At the end of July 2016, the fighting between the Ba'athist government and Islamist rebels in and around Aleppo intensified. On 12 August 2016, the Syrian Democratic Forces fully captured the northern city of Manbij from ISIL and some days later announced a new offensive towards Al-Bab, which could eventually connect the Kurdish regions in Northern Syria. On 16 August the battle of al-Hasakah began with some minor clashes. On 19 August, the Pentagon warned the Syrian Ba'athist government against "interfering with coalition forces or our partners" in the northeastern region near the city of al-Hasakah, adding that the U.S. had the right to defend its troops which were operational in the area. On 22 August, the Kurdish YPG, having captured Ghwairan, the only major Arab neighbourhood in Hasaka that had been in Ba'athist government hands, launched a major assault to seize the last Ba'athist government-controlled areas of the northeastern Syrian city of Hasaka, after a Russian mediation team failed to mend the rift between the two sides; the next day the capture of the city was completed. On 24 August 2016, Turkey′s armed forces invaded Syria in the Jarabulus area controlled by ISIL starting what the Turkish president called the Operation Euphrates Shield, aimed against, according to his statement, both the IS and Kurdish ″terror groups that threaten our country in northern Syria″. The Syrian Ba'athist government denounced the intervention as a "blatant violation of its sovereignty" and said that "fighting terrorism isn’t done by ousting ISIS and replacing it with other terrorist organizations backed directly by Turkey". The PYD leader Salih Muslim said that Turkey was now in the "Syrian quagmire" and would be defeated like IS. Speaking in Ankara the same day, U.S. vice president Joe Biden indirectly endorsed Turkey′s move and said that the U.S. had made it clear to the Syrian Kurdish forces that they should move back east across the Euphrates, or lose U.S. support. As Turkish troops and the Turkish-aligned Syrian rebels took control of Jarablus and moved further south towards the Syrian town of Manbij, they clashed with the Kurdish YPG, which led the U.S. officials to voice concern and issue a warning to both sides. On 29 August, U.S. Defense Secretary Ashton Carter specified that the U.S. did not support Turkey′s advance south of Jarablus. The warning as well as an announcement made by the U.S. of a tentative ceasefire between the Turkish forces and the Kurds in the area of Jarablus were promptly and angrily dismissed by Turkey. However, combat between the Turkish forces and the SDF died down, and instead Turkish forces moved West to confront ISIL. In the meantime the SDF, including Western volunteers, continued to reinforce Manbij. At sunset on 12 September 2016, a U.S.-Russian brokered cease-fire came into effect. Five days later, the U.S. and other coalition members′ jets bombed Syrian Army positions near Deir ez-Zor—purportedly by accident — but with Russia contending that it was intentional — killing at least 62 Syrian troops that were fighting ISIL militants. On 19 September the Syrian Army declared that it would no longer observe the truce. Also on 19 September, an aid convoy in Aleppo was attacked with the U.S. coalition blaming the Russian and Syrian governments for the attack and these same governments denying these accusation and instead blaming terrorists for the attack. On 22 September, the Syrian army declared a new offensive in Aleppo and on 14 December the final rebel stronghold in Aleppo was recaptured by the Syrian Ba'athist government, followed by a ceasefire agreement. On 26 October 2016, US Defense Secretary Ash Carter said that an offensive to retake Raqqa from ISIL would begin within weeks. On 26 October the US Defense Secretary said that an offensive to retake Raqqa from ISIL would begin within weeks. The SDF, using up to 30,000 Arab, Christian and Kurdish troops, and with support from the Western Coalition, undertook an operation codenamed Wrath of Euphrates. By December 2016 it had captured many villages and land west of Raqqa previously controlled by ISIL and by January 2017, much of the land west of Raqqa had been seized and the second phase of the operation was complete. In December 2016, Syrian Ba'athist government forces completely recaptured all of rebel-held parts of Aleppo, ending the 4-year battle in the city. On 29 December Russian President Vladimir Putin announced a new ceasefire deal had been reached between the Syrian Ba'athist Government and opposition groups (excluding UN-designated terrorist groups such as ISIL and Jabhat Fateh al-Sham), with Russia and Turkey acting as guarantors and Iran as a signatory, which came into effect at 00:00 Syrian time (02:00 UTC) on 30 December. Talks were scheduled to be held between the groups in Astana, capital of Kazakhstan, on 15 January. On the same day the United Nations Office for the Coordination of Humanitarian Affairs reported that four million people in Damascus and surrounding areas were without reliable access to water after major supply infrastructure had been targeted, and called upon all parties to guarantee basic services. On 2 January 2017, rebel groups said that they would disengage from planned talks after alleged ceasefire violations by Ba'athist Government forces in the Wadi Barada valley near Damascus. At the end of January, Ba'athist government forces managed to capture Wadi Barada and the water supply of Damascus was restored. On 14 February, the ceasefire between Assad forces and rebels collapsed throughout the country, leading to fresh clashes in various locations and a fresh rebel offensive in Daraa. A new peace conference in Geneva was held on 23 February, the same day as Turkish forces captured Al-Bab from ISIL north-east of Aleppo. Syrian Ba'athist government forces started an offensive east of Aleppo to conquer Dayr Hafir from ISIL and prevent further Turkish advances. On 17 March, Syrian military fired S-200 missiles at Israeli jets over Golan Heights. The Israeli military claimed that the Arrow anti-ballistic system intercepted one missile, while the Syrian military claimed that they had downed an Israeli jet. The Russian Foreign Ministry summoned the Israeli ambassador for talks. The U.N. Commission of Inquiry on Syria reported that on 20 March up to 150 civilians were killed near a school in Raqqa by U.S.-led coalition air strikes. Ba'athist Government forces entered Dayr Hafir, the last stronghold held by ISIL in East Aleppo, and secured it by 23 March. This opened up an opportunity to push south into the Raqqa governorate; however on the same day, an SDF contingent landed on a peninsula west of Raqqa via boats and helicopters in an effort to cut off the Syrian Arab Army from entering the ISIL's de facto capital, Raqqa. 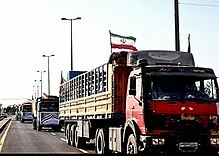 On 28 March, an agreement was reportedly brokered by Qatar and Iran for the evacuation for four besieged towns in Syria. The deal involved evacuating the residents of al-Fu'ah and Kafriya, two towns in the Idlib Governorate besieged by rebel forces, in exchange for the evacuation of residents and rebels in Zabadani and Madaya, two towns under siege by Ba'athist government forces in the Rif Dimashq Governorate. After the chemical attack on Khan Shaykhun, warships of the U.S. Navy launched 59 Tomahawk missiles at the Syrian Ba'athist government's Shayrat Air Base which was said the be the source of the chemical attack. The American attack, taking place on 7 April 2017, was the first officially announced deliberate attack on Syrian Ba'athist government forces. Due to being launched without authorisation from Congress or the UN Security Council, the strike triggered an emergency UNSC meeting. Russian President Putin viewed the U.S. attack as "an act of aggression against a sovereign country violating the norms of international law". The U.S. representative responded that "the moral stain of the Assad regime could no longer go unanswered." American forces struck the Syrian military again on 18 May, when a Syrian army convoy advancing in the vicinity of the border town of al-Tanf, which hosted a US-controlled airbase, came under attack by US fighter jets. Nevertheless, the Syrian Ba'athist government's desert offensive continued and on 9 June Ba'athist government forces secured a part of Syrian–Iraqi border for the first time since 2015. Meanwhile, intense fighting between Ba'athist government forces and rebel groups that began north of Hama on 21 March continued. By 29 March, Ba'athist government forces, which had halted the rebel offensive at the outskirts of Hama, began a counterstrike, and by 16 April had reversed all rebel gains; by the end of April they had captured the towns of Halfaya and Taybat al-Imam. On 12 April, the agreement to exchange the inhabitants of the rebel-held towns of Zabadani and Madaya with the inhabitants of the pro-Ba'athist government towns of Al-Fu'ah and Kafraya began to be implemented. On 15 April, a convoy of buses carrying evacuees from Al-Fu'ah and Kafriya was attacked by a suicide bomber in Aleppo, killing more than 126 people. On 24 April, the Turkish Air Force conducted several airstrikes on YPG and YPJ positions near al-Malikiyah. The attacks were condemned by the US. On 4 May, Russia, Iran, and Turkey signed an agreement in Astana to create four "de-escalation zones" in Syria: the Idlib Governorate, the northern rebel-controlled parts of the Homs Governorate, the rebel-controlled eastern Ghouta, and the Jordan–Syria border. The agreement was rejected by some rebel groups, and the Kurdish Democratic Union Party or PYD also denounced the deal, saying that the ceasefire zones are "dividing Syria up on a sectarian basis". The ceasefire came into effect on 6 May. On 7 July 2017, the U.S., Russia, and Jordan agreed to a ceasefire in part of southwestern Syria, Russia giving assurances that Assad would abide by the agreement. On 19 July it was reported that the U.S. had decided to halt the CIA program to equip and train anti-Ba'athist government rebel groups, a move sought by Russia. On 5 September the Ba'athist government's Central Syria offensive culminated in the breaking of the three-year ISIL siege of Deir ez-Zor, with active participation of Russian air force and navy. This was followed shortly thereafter by the lifting of the siege of the city's airport. By mid-November the Ba'athist government forces and allied militia established full control over Deir ez-Zor and captured the town of Abu Kamal in eastern Syria, near the border with Iraq and Iraq's town of al-Qaim, which was concurrently captured from ISIL by the Iraqi government. On 6 December Russia declared Syria to have been "completely liberated" from ISIL; on 11 December President Putin visited the Russian base in Syria, where he announced that he had ordered the partial withdrawal of the forces deployed to Syria. On 26 December, Russian defence minister Sergey Shoigu said that Russia had set about "forming a permanent grouping" at its naval facility at Tartus and Hmeymim airbase. Two days later, Russian foreign minister Sergey Lavrov said that Russia believed that the U.S. forces must leave Syrian territory completely once remnants of the terrorists were completely eliminated. On 20 January, the Turkish military began a cross-border operation in the Kurdish-majority Afrin Canton and the Tel Rifaat Area of Shahba Canton in Northern Syria, against the Kurdish-led Democratic Union Party in Syria (PYD), its armed wing People's Protection Units (YPG), and Syrian Democratic Forces (SDF) positions. In January—February 2018, the Syrian Army and its allies continued to advance against the forces of Tahrir al-Sham (HTS) and other rebels in the Hama Governorate. On 10 February, the Syrian Air Defense Force shot down an Israeli F-16 fighter jet in response to an Israeli cross-border raid on Iranian targets near Damascus through Lebanese airspace. On 21 February, the Ba'athist government began an operation to capture rebel-held Ghouta east of Damascus; the operation started with an intensive air campaign. On 18 March, on the 58th day of the Turkish military operation in Afrin, Operation Olive Branch, the Turkish-backed Free Syrian Army (TFSA or FSA), Turkish Armed Forces and disparate rebel groups captured Afrin from the YPG and the YPJ, displacing up to 200,000 people. Shortly after the capture, TFSA militants looted parts of the city and destroyed numerous pro-Kurdish symbols as Turkish Army troops solidified control by raising Turkish flags and banners over the city. The battle was seen as an overall strategic victory, because it would open a ground corridor into nearby Idlib province (a stronghold for al-Qaida-linked militants) as well as linking them with other rebel factions that wanted to join the coalition there. Turkey's relationship with the US was stretched to breaking point by the Afrin operation, which pitted the two NATO allies and their Syrian proxies against one another. On 7 April 2018, a chemical attack was reported in the city of Douma, with 70 people killed and 500 injured. On-site medics stated the cause of those deaths was exposure to chlorine and sarin gas. The Syrian Ba'athist government denied any use of chemical weapons. Following the incident in Douma, the UN Security Council failed to adopt three competing resolutions on an inquiry into the alleged chemical attack, with Russia and the U.S. clashing over the issue. Following the incident, Syrian Ba'athist government forces entered and established control over the city of Douma, ending the five year Siege of Ghouta. On 14 April the U.S., U.K. and France launched missile strikes on multiple Ba'athist government targets in Syria as a response to the suspected chemical attack in Douma. On 19 April the Syrian army and allied Palestinian groups began an offensive against the Yarmouk camp for Palestinian refugees in Southern Damascus, which had been partially occupied by ISIL. On 21 May, pro-Ba'athist government troops fully recaptured Yarmouk camp, thus allowing the Syrian Arab Army to fully control the capital after 6 years. On 1 May, the U.S. government announced the U.S.-led coalition's "operations to liberate the final ISIS strongholds in Syria", which would ensure that "populations liberated from ISIS are not exploited by the Assad regime or its Iranian supporters". In May, Israel launched an extensive strike against Iranian targets in Syria (known as Operation House of Cards) after a series of short military confrontations between Israeli and Iranian forces in Syria. On 6 July, as a result of the Southern Syria offensive, which had begun in June, the Syrian Army backed by Russian forces reached the border with Jordan and captured the Nasib Border Crossing. By the end of July, the Southern Syria offensive ended, resulting in the complete Syrian Ba'athist government's control of Daraa and Quneitra provinces. On 17 September Israel hit multiple targets in western Syria. While trying to strike the Israeli planes, Syrian forces shot down a Russian plane, causing the deaths of 15 Russians. The strikes occurred a few hours after a Russo-Turkish agreement to create a demilitarized zone around Idlib Governorate was achieved, which postponed an imminent offensive operation by Syrian Ba'athist government forces and its allies. Russia blamed Israel for the incident; Russian defence ministry's spokesman Igor Konashenkov named the Israeli military as the sole culprit of the accident. In the aftermath of the strikes, on 24 September 2018, Russian defence minister Sergey Shoygu confirmed that the Syrian army would receive S-300 air-defence missile systems to strengthen Syria's combat air defence capabilities. He added that the previous cancellation of the contract for S-300 delivery in 2013 had been due to Israel's request but following the downing of the Russian aircraft in Syria the situation had changed. The S-300 has modern IFF systems which would prevent the missiles from targeting Russian aircraft. On 17 September 2018 the Russian president Vladimir Putin and Turkish president Recep Tayyip Erdoğan reached an agreement to create a buffer zone in Idlib. On 12 December, the Turkish government announced it would begin operations against Rojava (the Democratic Federation of Northern Syria) "in a few days" in an apparent rebuke of US efforts at ensuring Turkish border security in the area. In response, the Pentagon said that any unilateral military action taken in northern Syria where US forces are operating would be "unacceptable." However, President Trump abruptly announced on 19 December 2018 the withdrawal of all troops from Syria, after which Turkey postponed the planned attack. Late on 25 December, Israel launched an attack from or across Lebanese air space, "in response to an anti-aircraft missile launched from Syria" according to the IDF; Russia condemned the strikes as provocative and said that they "directly threatened two airliners". Reports from Syria said an arms depot in Qatifah, about 40 km north-east of Damascus, was hit, injuring three soldiers. On 28 December, Ba'athist government forces were said to be on the outskirts of the strategically important northern city of Manbij, but the city was still held by Kurdish forces and US troops were still there. On 30 December, the Syrian Ba'athist government officially allowed Iraq to strike ISIL on Syrian territory. Iraq struck ISIL targets in Deir ez-Zor the next day. Beginning on January 1 2019 and lasting through January 10 2019, Hayat Tahrir al-Sham(HTS) attacked and seized the positions of the National Front for Liberation(NLF) across rebel-held Idlib and Aleppo. On January 9 2019, a truce was reached between the two factions, with the NLF surrendering their last positions in Idlib to Hayat Tahrir al-Sham and evacuating to areas under control of the Turkish-backed Free Syrian Army in Afrin. On January 10, Hayat Tahrir al-Sham took control of the remaining positions previously held by the NLF. On 5 January 2019, a Kurdish fighter was killed and two British special forces troops were seriously injured by an ISIL attack near the town of Deir al-Zour. The injured men were evacuated by US forces. On 6 January 2019, US National Security Adviser John Bolton said, on a trip to Israel and Turkey, that the withdrawal of US troops from Syria depends on certain conditions, including the assurance that the remnants of ISIL forces are defeated and Kurds in northern Syria were safe from Turkish forces. However, Turkey's President Recep Tayyip Erdogan rejected the call to protect Kurdish troops, whom he regarded as terrorist groups. Also on 6 January, the SDF said that they'd caught and arrested two American ISIL fighters, along with suspected fighters from Ireland and Pakistan, who had been planning a terrorist attack on fleeing Syrian civilians. On 10 January 2019, US Secretary of State, Mike Pompeo, said at a joint news conference with his Egyptian counterpart Sameh Shoukry in Cairo that the US would withdraw its troops from Syria while continuing the battle against ISIL, but warned that there would be no US reconstruction aid for areas controlled by Syrian President Bashar al-Assad until Iran and its proxies had left. On 15 January, a suicide bombing by an ISIL militant next to a US patrol in Kurdish-held Manbij killed 18 people, including four US service personnel, and wounded 18, on the same day that US vice-president Mike Pence claimed that ISIL had been defeated. On 23 March, after many weeks of sporadic fighting as civilians left Baghuz, the SDF says the five-year "caliphate" was over and ISIL was now defeated in Syria. On 20 April, ISIL reported that they had killed 35 government troops in the Homs and Deir al-Zour provinces; SOHR reported 27 killed, saying that this was the largest attack since ISIL had been declared defeated. Thousands of ISIL fighters and their families captured from Baghuz remained in camps nearby. ^ As at 3 January 2019, the information in the narrative section here have not been fully synced with the linked-to sub-articles. ^ a b "Syria profile – Timeline". 12 July 2017. Retrieved 15 July 2017 – via www.bbc.com. ^ "Syria's civil war: key facts, important players – CBCNews.ca". www.cbc.ca. Retrieved 15 July 2017. ^ "Syria in civil war, Red Cross says". 15 July 2012. Retrieved 15 July 2017 – via www.bbc.com. ^ Fahim, Kareem; Saad, Hwaida (8 February 2013). "A Faceless Teenage Refugee Who Helped Ignite Syria's War". The New York Times. Retrieved 7 August 2015. ^ "Mid-East unrest: Syrian protests in Damascus and Aleppo". BBC. Retrieved 7 August 2015. ^ a b "Middle East unrest: Silence broken in Syria". BBC. Retrieved 7 August 2015. ^ "Syria: Seven Police Killed, Buildings Torched in Protests". Israel National News. Retrieved 18 August 2015. ^ "The struggle for Syria in 2011" (PDF). Understanding War. Retrieved 7 August 2015. ^ "Assad blames conspirators for Syrian protests". The Guardian. Retrieved 7 August 2015. ^ "US policy on Syria 'depends on success in Libya'". BBC News. 24 May 2011. Retrieved 7 March 2014. ^ "Armed residents put up resistance to Syrian army". Khaleej Times (Dubai). 31 May 2011. Retrieved 2 April 2014. ^ "Syria protests: Rights group warns of 'Deraa massacre'". BBC News. 5 May 2011. Archived from the original on 6 May 2011. Retrieved 2 February 2014. ^ Salloum, Raniah (10 October 2013). "From Jail to Jihad: Former Prisoners Fight in Syrian Insurgency". Spiegel. Retrieved 27 May 2014. ^ "UN: Syria now in a civil war". MSNBC. 1 December 2011. Retrieved 26 December 2011. ^ "Deadly Reprisals: deliberate killings and other abuses by Syria's armed forces". Amnesty International. June 2012. Retrieved 25 June 2012. ^ "Syria: Repression continues despite Annan plan hopes". Amnesty International. 3 April 2012. Retrieved 30 June 2012. ^ a b "Observations on the Air War in Syria" (PDF). Air & Space Power Journal. March – April 2013. ^ "Iran reaffirms full support for Annan's Syria peace plan". Al Arabiya. 10 July 2012. Archived from the original on 11 July 2012. Retrieved 10 July 2012. ^ "Kofi Annan resigns as UN Syria envoy". The Times of India. Retrieved 2 August 2012. ^ "Deadly violence flares in Syria as EU-Russia seek solutions". Al Arabiya. 4 June 2012. Archived from the original on 5 July 2012. Retrieved 6 July 2012. ^ "Assad names new Syrian PM, army battles rebels". Trust. Reuters. 6 June 2012. Archived from the original on 24 February 2013. Retrieved 6 July 2012. ^ "New 'massacre' reported in Syria's Hama province". BBC News. 7 June 2012. ^ "Syria UN team 'shot at' near Qubair 'massacre site'". BBC News. 7 June 2012. ^ "Syria in civil war, says UN official Herve Ladsous". BBC News. 12 June 2012. Retrieved 7 January 2014. ^ Ivan Watson (12 June 2012). "Syria: Battle for the cities". CNN. Retrieved 7 February 2013. ^ "Syria's Qusayr prepares for Ramadan under siege". 10 July 2012. Retrieved 20 July 2013. ^ Abouzeid, Rania (20 July 2012). "In Rebel Syria: Celebrating Assad's Departure–Even Though He's Still Staying". Time. Retrieved 10 August 2013. ^ "Syria in civil war, Red Cross says". BBC. 15 July 2012. Retrieved 27 May 2014. ^ Ruth Sherlock; Adrian Blomfield (17 July 2012). "Syrian rebels launch campaign to 'liberate' Damascus". The Daily Telegraph. London. Retrieved 18 July 2012. ^ Damien McElroy (18 July 2012). "Assad's brother-in-law and top Syrian officials killed in Damascus suicide bomb". The Daily Telegraph. London. Retrieved 18 July 2012. ^ "Syria blast: Security chief Ikhtiar dies from wounds". BBC News. 20 July 2012. Retrieved 20 July 2012. ^ Solomon, Erika (18 July 2012). "Two Syrian rebel groups claim Damascus attack". Reuters. Retrieved 18 July 2012. ^ Aneja, Atul (28 July 2012). "A decisive battle being waged over Aleppo". The Hindu. Chennai, India. ^ Weaver, Matthew; Whitaker, Brian (25 July 2012). "Syria crisis: Assad strikes back with jets in Aleppo and Damascus – live updates". The Guardian. London. Retrieved 25 July 2012. ^ "Syria using fighter jets against rebels: UN". The Hindu. Chennai, India. Associated Press. 1 August 2012. ^ "Syrian Air Force & Air Defense Overview". Institute for the Study of War. 25 October 2012. ^ Arango, Tim (19 July 2012). "Iraq Says Rebels in Syria Control Border Posts". The New York Times. Retrieved 19 July 2012. ^ "Syrian rebels seize control of border crossing on frontier with Turkey". CBS News. 19 September 2012. Retrieved 5 October 2012. Barnard, Anne; Mourtada, Hania (23 September 2012). "Rebel Group Says It Is Now Based in Syria, a Major Step". The New York Times. Retrieved 23 September 2012. ^ Abdulmajid, Adib (8 September 2012). "Deadly Attack Claims Many Lives in Aleppo's Kurdish Sector". Rudaw. Archived from the original on 6 April 2013. Retrieved 10 February 2013. ^ "PYD Kills Syrian Soldiers in Revenge Attack". Rudaw. 10 September 2012. Archived from the original on 22 November 2012. Retrieved 10 September 2012. ^ "Assad forces killed in northeast car bomb". Syria Live Blog. Al Jazeera English. 30 September 2012. Archived from the original on 10 October 2012. Retrieved 10 February 2013. ^ Naeem, Asad (11 October 2012). "Syria rebels cut highway to northern battlefields". Business Recorder. Archived from the original on 25 October 2014. ^ Di Giovanni, Janine (18 October 2012). "Denial Is Slipping Away as War Arrives in Damascus". The New York Times. Retrieved 20 October 2012. ^ Weaver, Matthew (30 October 2012). "Syria conflict: what next after failed ceasefire?". The Guardian. London. ^ Gladstone, Rick (31 October 2012). "Syrian Air Force Commander Is Reported Killed". The New York Times. Retrieved 31 October 2012. ^ "Syria army quits base on strategic Aleppo road". Reuters. 2 November 2012. Retrieved 6 November 2012. ^ "Syrian rebels struggle to keep regime Air Force on the ground (+video)". The Christian Science Monitor. 26 November 2012. Retrieved 26 November 2012. ^ "Rebels target air base in battle against aerial bombardment in Syria". CNN. 4 November 2012. Retrieved 6 November 2012. ^ Hubbard, Ben (20 November 2012). "Base Seizure Sharp Blow to Syria's Efforts to Roll Back Rebel Gains". Associated Press. Archived from the original on 13 July 2015. Retrieved 19 March 2013. ^ "Virtually all Internet service in Syria shut down, group says". CNN. 29 November 2012. Retrieved 6 December 2012. ^ "Syria's Internet Restored After Two Day Blackout". The Epoch Times. 2 December 2012. Archived from the original on 13 July 2015. Retrieved 17 February 2013. ^ NRC Handelsblad (Dutch), 14 August 2014. ^ a b Gordon, Michael R.; Schmitt, Eric (20 December 2012). "Syria Fires More Scud Missiles at Rebels, U.S. Says". The New York Times. Retrieved 27 December 2012. ^ "Syria denies using Scud missiles in fighting armed militia". Xinhua News Agency. 13 December 2012. Retrieved 17 December 2012. ^ Ruth Sherlock (17 December 2012). "Syrian rebels cut off Bashar al-Assad's escape route". The Daily Telegraph. London. Retrieved 17 December 2012. ^ "Syria rebels make further gains". BBC. 18 December 2012. Retrieved 6 February 2013. ^ "Syrian rebels launch major assault on army across Hama". The News International. 18 December 2012. Archived from the original on 13 July 2015. Retrieved 18 December 2012. ^ "Rebels seize towns in central Syria". Reuters. 19 December 2012. Retrieved 20 December 2012. ^ "Syrian rebels fully capture town near Turkish border after weeks of siege". Fox News Channel. Associated Press. 24 December 2012. Retrieved 22 July 2013. ^ "Syrian rebels seize key air base, activists say". USA Today. Associated Press. 11 January 2013. Retrieved 11 January 2013. ^ Saad, Hwaida; Gladstone, Rick (11 February 2013). "Syrian Insurgents Claim to Control Large Hydropower Dam". The New York Times. Retrieved 12 February 2013. ^ "Rebels take control of military airport in North Syria, NGO says". NOW News. 12 February 2013. Retrieved 12 February 2013. ^ "Syrian air base falls, Assad forces under pressure". Reuters. 12 February 2013. Retrieved 12 February 2013. ^ "Jihadists seize Syria town on Iraq border". NOW News. 14 February 2013. Retrieved 16 February 2013. ^ "Syria conflict: Many dead in huge Damascus bombing". BBC. 21 February 2013. Retrieved 21 February 2013. ^ Barnard, Anne; Hwaida Saad; Hania Mourtada (21 February 2013). "Car Bomb in Damascus Kills Dozens, Opposition Says". The New York Times. Retrieved 21 February 2013. ^ "Syrian rebels attack Hezbollah's positions in Lebanon: FSA commander". Hürriyet Daily News. 22 February 2013. ^ "Syria: Fierce clashes in provincial capital Raqqa". BBC. 2 March 2013. Retrieved 6 March 2013. ^ "Syria, Iran say US aid to rebels will extend war". Yahoo News. Associated Press. 3 March 2013. Retrieved 22 July 2013. ^ "Syria Live Blog". Al Jazeera. Retrieved 6 March 2013. ^ "Rebels 'seize most of Syria police academy'". BBC. 3 March 2013. Retrieved 6 March 2013. ^ a b Zeina Karam (5 March 2013). "Syrian Rebels Battle Regime Holdouts in Raqqa". USA Today. Associated Press. Retrieved 27 August 2014. ^ Barnard, Anne (18 March 2013). "Syria Warplanes Hit Lebanon for First Time". The New York Times. Retrieved 8 August 2013. ^ Jim Muir (21 March 2013). "Syria mosque blast: Pro-Assad cleric among dozens dead". BBC. ^ "Syria rebels seize southern base, border area". Reuters. 23 March 2013. ^ "Rebels seize Jordan-Syria border area: activists". The Daily Star. 24 March 2013. ^ Holmes, Oliver (25 March 2013). "Syrian rebels bombard central Damascus, army artillery hits back". Reuters. ^ Baker, Aryn (12 May 2013). "Savage Online Videos Fuel Syria's Descent into Madness". Time. ^ Bouckaert, Peter (13 May 2013). "Is This the Most Disgusting Atrocity Filmed in the Syrian Civil War?". Foreign Policy. Retrieved 14 May 2013. ^ "Outrage at Syrian rebel shown 'eating soldier's heart'". BBC. 14 May 2013. ^ Dehghanpisheh, Babak (29 March 2013). "Rebels claim to take key city in southern Syria". The Washington Post. ^ Gladstone, Rick; Droubi, Hala (3 April 2013). "New Rebel Gains Reported in Southern Syria With Seizure of Military Base". The New York Times. ^ a b c van Wilgenburg, Wladimir (17 January 2013). "Kurdish Forces Clash with Main Syrian Opposition in Syria, Reports Say". Rudaw. Archived from the original on 18 January 2013. Retrieved 4 February 2013. ^ a b c "Al Maʿbada: Fighting between YPG and Syrian military". 24 January 2013. Retrieved 5 February 2013. ^ a b ANF (20 January 2013). "Clashes getting heavier in Serêkaniyê-UPDATE". Firat News. Archived from the original on 7 February 2013. Retrieved 4 February 2013. ^ "Al-Maʿbada: YPG gains control of oil field". KurdWatch. 3 February 2013. Retrieved 5 February 2013. ^ "Aleppo: Heavy fighting between YPG and Syrian Army". KurdWatch. 24 February 2013. Retrieved 27 February 2013. ^ a b "Five killed in Syrian attack in Aleppo". Firat News. 27 February 2013. Archived from the original on 28 July 2013. Retrieved 27 February 2013. ^ van Wilgenburg, Wladimir (10 February 2013). "Kurdish Fighters Kill 8 on Aleppo Clashes". Rudaw. Archived from the original on 15 February 2013. Retrieved 10 February 2013. ^ "Fierce fighting in Aleppo – VIDEO". Firat News. 11 February 2013. Archived from the original on 28 July 2013. Retrieved 16 February 2013. ^ "Syrian Kurdish Militia Takes Over Oil Fields". Al-Monitor. Retrieved 24 October 2014. ^ "Syrian forces Loyal to Asaad break Rebel Blockade in North Syria". Jafria News. 17 April 2013. Archived from the original on 3 November 2014. Retrieved 25 July 2018. ^ "Syria rebels claim strategic airbase". News.com.au. 18 April 2013. ^ "Syria troops seize strategic Homs village". Global Post. 18 April 2013. Archived from the original on 1 November 2013. ^ Lebovic, Matt (19 April 2013). "Fierce Battles in Syria; US To Raise Aid To Rebels". The Times of Israel. ^ Sebastian Usher (22 April 2013). "Syria army seizes Jdaidet al-Fadl 'killing dozens'". BBC. ^ "Syria army closes in on Qusayr near Lebanon". Al Arabiya Network. 21 April 2013. Retrieved 7 June 2015. ^ Yacoub, Khaled (21 April 2013). "Syria fighting flares both sides of Lebanese border". Reuters. ^ "Lebanon border area mired in Syrian conflict". Global Post. 21 April 2013. Archived from the original on 29 October 2014. ^ "Assad Thinks He's Winning The Syrian War – And He May Be Right". 25 April 2013. ^ "Syria clashes destroy ancient Aleppo minaret". BBC. 24 April 2013. ^ Solomon, Erika (2 May 2013). "Dozens dead as Assad's forces storm coastal village". Reuters. Retrieved 10 August 2013. ^ "Dozens killed in Syria's Banias: watchdog". The Daily Star. 2 May 2013. ^ "New York Times, 15 May 2013". nytimes.com. Retrieved 21 October 2015. ^ "Syrian troops capture Damascus suburb near airport". 15 June 2013. ^ "Syrian troops capture Damascus suburb near airport, days after attack on the facility". StarTribune. Beirut. 15 June 2013. Retrieved 7 June 2015. ^ Cockburn, Patrick (25 June 2013). "Tal Kalakh: The Syrian town that lost the will to fight – The once rebel stronghold is back in the hands of the Syrian army". The Independent. London. ^ "Syria rebels lose border town". News24.com. 26 June 2013. ^ "Syrian army, backed by jets, launches assault on Homs". Haaretz. 29 June 2013. ^ Karouny, Mariam; Holmes, Oliver (12 July 2013). "New front opens in Syria as rebels say al Qaeda attack means war". Reuters. Retrieved 12 July 2013. ^ Syria rebels seize parts of Deraa's Nawa city (Blog). Al Jazeera (17 July 2013). ^ "Kurds seize town on Syria-Turkey border, Ankara concerned". Reuters. 18 July 2013. ^ "Syrie: les Kurdes chassent des jihadistes d'un village du nord-est". Lorientlejour.com. 18 September 2013. ^ "The Civil War Within Syria's Civil War". Foreign Policy. 28 August 2013. ^ "Syria rebels seize key northern town: NGO". Ahram Online. 22 July 2013. ^ Homs province: Activists in the town of... – Syrian Observatory for Human Rights. Facebook. ^ "Syrian troops capture historic mosque in Homs". USA Today. 27 July 2013. ^ "Syria: Government forces take control of strategic Homs neighbourhood". Toronto Star. 30 July 2013. ^ Isabel Nassief (22 August 2013). "Regime Regains Ground on the Coast". Reuters. Retrieved 5 September 2013. ^ Mroue, Bassam (5 August 2013). "hrw-syrian-missiles-kill-hundreds-civilians". Associated Press. Archived from the original on 13 July 2015. Retrieved 12 September 2013. ^ "Syrian rebel fighters guilty of serious abuses, says Human Rights Watch". CNN. 11 October 2013. ^ Evans, Dominic (19 August 2013). "Assad's forces push back rebels in Syria's Alawite mountains". Reuters. ^ "Syria army recaptures all rebel positions in Latakia'". Agence France-Presse. 19 August 2013. ^ "The New York Times | Syrian Civilians Bore Brunt of Rebels' Fury, Report Says". nytimes.com. Retrieved 21 October 2015. ^ "Syrian rebels capture military airport near Turkey". Reuters. 5 August 2013. 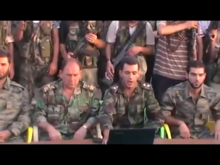 ^ "FSA takes control of Menagh air base near Aleppo". Al Arabiya. 6 August 2013. Retrieved 8 August 2013. ^ Sam Dagher; Farnaz Fassihi (22 August 2013). "Syria Presses Offensive, Shrugs Off Gas Attack Claims". The Wall Street Journal. Retrieved 5 September 2013. ^ "Army Retakes Strategic Town in Northwest Syria". Naharnet.com. 3 September 2013. ^ "Assad forces capture strategic Syria northern town". News24.com. 3 September 2013. ^ "Syria rebels take control of strategic town". Al Jazeera. 26 August 2013. ^ Jamal Halaby (8 September 2013). "Activists: Syrian rebels take Christian village". The Seattle Times. Retrieved 7 June 2015. ^ Bill Neely (14 September 2013). "Maaloula's cathedral and churches empty of Christians as Syria's latest front-line fight takes its toll". The Telegraph. London. Retrieved 23 October 2013. ^ "Takfiri militants clash with forces of Free Syrian Army". Press TV. 18 September 2013. Archived from the original on 13 July 2015. ^ Morris, Loveday (18 September 2013). "Al-Qaeda-linked fighters seize Syrian town of Azaz from more moderate rebels". The Washington Post. ^ Dziadosz, Alexander (3 October 2013). "Syria rebels try to end infighting near Turkish border". Reuters. ^ "Activists: Syrian troops and pro-Ba'athist government militiamen storm Sunni village, killing 15". Fox News. Associated Press. 21 September 2013. Retrieved 23 October 2013. ^ Thomas Escritt (21 September 2013). "Syria meets deadline for chemical weapons disclosure". Reuters. Retrieved 23 October 2013. ^ Marah Mashi (19 September 2013). "Syrian Army Makes Headway in Damascus and Homs". Al-Akhbar. ^ "Events: Thursday 3 October 2013". Support Kurds in Syria. 3 October 2013. Retrieved 23 October 2013. ^ "Students reported killed in Syria air attack". Al Jazeera. 29 September 2013. Retrieved 23 October 2013. ^ "Syria army retakes northern strategic town". Gulf News. 3 October 2013. Archived from the original on 4 October 2013. ^ "Syria Live Blog – Live Blogs – Al Jazeera English". Al Jazeera. 5 February 2011. ^ "Syria rebels seize guard post on Jordan border". Globalpost.com. 9 October 2013. Archived from the original on 26 January 2014. ^ Khaled Yacoub Oweis (11 October 2013). "Syrian army retakes two Damascus suburbs from rebels – activists". The Star. Malaysia. ^ "Syrian opposition: Hezbollah, Iraqi militia capture Damascus suburb". The Jerusalem Post. 21 November 2013. ^ "Deir Ezzour province: A fighter from... – Syrian Observatory for Human Rights". Facebook. ^ "Boosted by Foreign Shi'ite Militia, Assad's Forces Advance on Aleppo". Voice of America. Reuters. ^ "Syria rebels urge Aleppo mobilisation to halt assault". BBC. 13 November 2013. ^ "Syrian military spy chief killed in battle – Middle East". Al Jazeera. ^ Dziadosz, Alexander (24 October 2013). "Syrian army seizes Damascus suburb from rebels: state TV". Reuters. ^ "Syria Kurdish fighters seize border post from Islamists". BBC. 26 October 2013. ^ Bassem Mroue (25 October 2013). "Syrian Kurds Capture Border Crossing With Iraq". Associated Press. ^ "Syrian forces capture town near chemical weapons site: Activists". The Daily Star. 1 November 2013. ^ "AFP: Air raids on rebel areas near Damascus, Kurds advance: NGO". Google. Archived from the original on 9 December 2013. ^ "Syrian government gaining ground in war, strengthening hand ahead of proposed peace talks". Fox News. Beirut. 16 November 2013. Retrieved 7 June 2015. ^ "Syria activists say rebels reach deal with Ba'athist government to ease blockade of rebel-held town". Fox News. 10 November 2013. Retrieved 16 January 2014. ^ a b c "Syria army retakes key base near Aleppo: state TV". Google News. Agence France-Presse. Archived from the original on 9 December 2013. ^ "Two Danes allegedly die fighting in Syria". The Copenhagen Post. ^ Diaa Hadid (11 November 2013). "Syria-based groups say talks may be 'last chance'". Nwherald.com. ^ "Syria army seeks to reopen Aleppo airport: military". The Daily Star. Lebanon. ^ N Lucas (13 November 2013). "Syrian media: Troops capture south Damascus suburb". U-T San Diego. ^ Yacoub, Khaled (13 November 2013). "Assad's forces make further gains around Damascus". Reuters. ^ Evans, Dominic (15 November 2013). "Assad's forces advance in northern Syria towards Aleppo". Reuters. ^ "Syrian troops besiege strategic town amid fierce fights". Xinhua News Agency. 18 November 2013. Retrieved 18 November 2013. ^ "Syria troops seize Qara village near Lebanon border". NOW. 19 November 2013. Retrieved 19 November 2013. ^ "Forces loyal to Syria's President Capture Raqqa". Reuters. 19 November 2013. Retrieved 4 December 2013. ^ "Islamist rebels capture Syria's largest oilfield: activists". Reuters. 23 November 2013. ^ Urquhart, Conal (23 November 2013). "Syrian Islamist rebels claim capture of key oilfield". The Guardian. Retrieved 23 November 2013. ^ Solomon, Erika (24 November 2013). "Scores killed as rebels battle to break siege of Damascus suburbs". Reuters. Retrieved 20 March 2014. ^ "Syrian troops capture town near Lebanon border". Haaretz. The Associated Press. 28 November 2013. Retrieved 7 June 2015. ^ "Rebels retake Christian town of Maaloula". The Daily Star. 3 December 2013. Retrieved 4 December 2013. ^ "Suicide Bomber Kills Four in Central Damascus, Abducted Nuns Taken to Yabrud". Naharnet. 3 December 2013. Retrieved 4 December 2013. ^ "Syria Islamists seize Turkey border crossing". The Daily Star. 10 December 2013. Retrieved 28 May 2015. ^ Dave Boyer (11 December 2014). "U.S., Britain to halt non-lethal aid to Syrian opposition". Washington Times. Retrieved 6 January 2014. ^ Patrick J. McDonnell & Nabih Bulos (9 December 2013). "Syrian army reportedly seizes third town along key north-south highway". Los Angeles Times. Beirut, Libanon. Retrieved 19 September 2015. ^ "Al-Qaida militants captured town in northern Syria". Associated Press. 19 September 2013. Archived from the original on 13 July 2015. Retrieved 4 January 2014. ^ "Syrian rebel factions tell al Qaeda groups to withdraw". France 24. 3 October 2013. Archived from the original on 2 September 2018. Retrieved 4 January 2014. ^ "ISIL captures Syrian town on border with Turkey". World Bulletin. 22 November 2013. Retrieved 4 January 2014. ^ Bulos, Nabih (5 January 2014). "Al Qaeda-linked group routed in Syrian rebel infighting". Los Angeles Times. Retrieved 5 January 2014. ^ Chulov, Martin (6 January 2014). "Syrian rebels oust al-Qaida-affiliated jihadists from northern city of Raqqa". The Guardian. ^ "'Hardly any' Qaeda militants left in Aleppo". Al Arabiya (English). Archived from the original on 5 October 2018. Retrieved 21 May 2014. ^ Moukalled, Diana (7 January 2014). "Syria: ISIS besieged by opposition fighters in Raqqa « ASHARQ AL-AWSAT". Aawsat.net. Archived from the original on 13 February 2014. Retrieved 20 March 2014. ^ "Turkish army strikes ISIS convoy in Syria". Retrieved 21 May 2014. ^ "Syria: Turkey Hits Islamic State of Iraq Convoy Near Border". EA WorldView. 29 January 2014. Retrieved 20 March 2014. ^ Moukalled, Diana (27 January 2014). "Key Al-Qaeda militant reportedly killed in Syria " ASHARQ AL-AWSAT". Aawsat.net. Archived from the original on 19 April 2014. Retrieved 20 March 2014. ^ "Islamist rebels oust ISIS from Syria's Deir Ezzor". Retrieved 21 May 2014. ^ "إدلب خالية من " داعش " بشكل كامل .. و الثوار يعلنون بدء معركة تحرير " خان شيخون " ( فيديو ) | عكس السير دوت كوم". Aksalser.com. Retrieved 20 March 2014. ^ Syria Comment – Joshua Landis (21 February 2014). "Saudis And CIA Agree To Arm Syrian 'Moderates' With Advanced Weapons – OpEd Eurasia Review". Eurasiareview.com. Archived from the original on 26 June 2015. Retrieved 20 March 2014. ^ Liz Sly for the Washington Post. "Renegade al-Qaida faction withdraws from Syrian border town of Azaz | World news | Guardian Weekly". Theguardian.com. Retrieved 20 March 2014. ^ "Syria Army Advancing on Key Rebel Town, Supply Route". Theepochtimes.com. 4 March 2014. Archived from the original on 26 June 2015. Retrieved 20 March 2014. ^ Bulos, Nabih; McDonnell, Patrick J. (8 March 2014). "Syria government forces seize strategic town near Lebanon border". LA Times. ^ "Syrian army advances amid new wave of explosions". Turkish Weekly. 7 March 2014. Archived from the original on 10 March 2014. Retrieved 21 May 2014. ^ "Syria conflict: Assad's forces fully control rebel stronghold of Yabroud, near Lebanon". 16 March 2014. ^ "Israel bombs Syria's Golan after blast". Al Jazeera English. Retrieved 20 March 2014. ^ Associated, The. "Syrian Troops Capture Village Near Lebanon Border". NPR. Archived from the original on 19 March 2014. Retrieved 20 March 2014. ^ "Syria rebels seize prison near Jordan, free inmates | Arab News – Saudi Arabia News, Middle East News, Opinion, Economy and more". Arabnews.com. 14 March 2014. Retrieved 20 March 2014. ^ a b "Le régime syrien reprend le Krak des Chevaliers et coupe la "route libanaise" des rebelles – L'Orient-Le Jour". Lorientlejour.com. 20 March 2014. Retrieved 27 March 2014. ^ Albert Aji (29 March 2014). "Syrian army takes two villages near Lebanon". The Daily Star. Retrieved 30 March 2014. ^ "Syria condemns Turkey 'aggression' after jet downed". Ndtv.com. Damascus. Agence France-Presse. 24 March 2014. Retrieved 7 June 2015. ^ "Rebels battle for northern Syria town | Video | Reuters.com". Uk.reuters.com. 17 March 2014. Retrieved 27 March 2014. ^ "Assad's cousin killed in fighting with Syrian rebels near Turkish border | JPost | Israel News". JPost. 23 March 2014. Retrieved 27 March 2014. ^ "Assad cousin killed in Syria's Latakia – Middle East". Al Jazeera English. Retrieved 27 March 2014. ^ "Rebels take northern Syrian town on main highway: activists". Reuters. 4 April 2014. ^ "Syrian army regains full control of Rankous | News , Middle East". The Daily Star. Retrieved 19 May 2014. ^ "Syria rebels advance in Aleppo city". Aljazeera.com. Retrieved 21 May 2014. ^ "Syria rebels surrender in border town". Aljazeera.com. Retrieved 21 May 2014. ^ "السيطرة على تل استراتيجي جديد على الحدود مع الجولان المحتل". Syriahr.com. 27 April 2014. Retrieved 21 May 2014. ^ "Syria Daily, April 25: Insurgents Take Key Regime Position in the Southwest". EA WorldView. 25 April 2014. Retrieved 19 May 2014. ^ "FSA strikes jihadist-held stronghold". The Times. 26 April 2014. Retrieved 19 May 2014. ^ "Activists: regime forces captured Tal Buraq". Syriahr.com. 29 April 2014. Retrieved 21 May 2014. ^ "Evacuation truce in key Syrian city of Homs goes into effect". CNN. 7 May 2014. Retrieved 8 May 2014. ^ "BBC News – Syria war: Air defence chief Gen Hussein Ishaq killed". Bbc.co.uk. 1 January 1970. Retrieved 19 May 2014. ^ "Syria election: Assad win expected amid civil war". BBC. 3 June 2014. ^ Ian Black. "Syria presidential election: Assad's stage-managed show of democracy". the Guardian. Retrieved 1 April 2015. ^ Sherlock, Ruth (2 June 2014). "Syria set to vote as the bloodshed goes on". Telegraph.co.uk. London. Retrieved 1 April 2015. ^ "Supreme Constitutional Court: Number of participants in Presidential elections reached at 11.634.412 with 73.42%". SANA. Damascus. 4 June 2014. Archived from the original on 7 June 2014. Retrieved 4 June 2014. ^ "Syrian President Bashar al-Assad wins third term". BBC. 4 June 2014. ^ "Kerry calls Syrian presidential vote 'meaningless'". Aljazeera. 4 June 2014. ^ "Foreign delegation in Syria slams West, endorses elections". The Times of India. Retrieved 8 June 2014. ^ "Indian Delegation to monitor Syria election on June 3". KohraM Hindi News. 2 June 2014. Retrieved 8 June 2014. ^ "International observers say Syrian elections were transparent". laInfo.es. 4 June 2014. Retrieved 8 June 2014. ^ "Arab League criticizes Syrian election plan". Reuters. 22 April 2014. Retrieved 2 October 2014. ^ GHAZANFAR ALI KHAN (4 June 2014). "GCC slams Syrian elections as 'farce'". Arab News. RIYADH. Retrieved 7 June 2015. ^ "Syria election: Bashar al-Assad re-elected president in poll with 'no legitimacy'". ABC. 4 June 2014. Retrieved 8 June 2014. ^ Sam Tarling (5 June 2014). "Inside Aleppo: the people refusing to leave Syria's shattered city". Telegraph. London. Retrieved 8 June 2014. ^ "Syria calls in North Korea to monitor its presidential election". The Week. Retrieved 2 October 2014. ^ Dagher, Sam (3 June 2014). "Syria Elections a Forum to Celebrate Assad". WSJ. Retrieved 2 October 2014. ^ "Bashar Assad claims 88.7 per cent of vote in Syrian election". thestar.com. Toronto. Retrieved 2 October 2014. ^ Sly, Liz (4 June 2014). "Kerry calls Syria election a 'great big zero'". Washington Post. Retrieved 2 October 2014. ^ Bar'el, Zvi (31 May 2014). "An Assad election win will bolster Syria's status quo". Haaretz. Retrieved 31 May 2014. ^ Saul, Heather (3 June 2014). "Syria elections 2014: Voters turn out for ballot denounced as a 'sham' by West". London: The Independent. Retrieved 5 June 2014. ^ "Syrians vote as war rages". Gulf-Times. Retrieved 2 October 2014. ^ "Assad wins vote branded illegitimate by opposition – Hindustan Times". hindustantimes.com. Retrieved 2 October 2014. ^ "Syrian troops recapture key border town near Turkey". 15 June 2014. ^ "KUNA : Battles in Syria claim 50 lives – SOHR". kuna.net.kw. Retrieved 1 April 2015. ^ "UPDATE 2-Ninety killed by Islamist attack on Syrian gas field – monitor". Reuters. 17 July 2014. Retrieved 3 August 2014. ^ "مقتل 65 من قوات النظام في شاعر". Syriahr.com. 20 July 2014. Retrieved 3 August 2014. ^ "Jihadists storm Syrian army base in Raqqa". The Daily Star Newspaper – Lebanon. Retrieved 2 October 2014. ^ "Jihadists capture key base from Syrian army". The Daily Star Newspaper – Lebanon. Retrieved 2 October 2014. ^ "Syrian militant commander admits collaboration with Israel". 14 August 2014. Retrieved 2 October 2014. ^ "Syria Daily, August 14: Are Insurgents Doomed in Aleppo?". EA WorldView. Retrieved 2 October 2014. ^ "Syrian army takes town near Damascus in blow to rebels". Reuters UK. 14 August 2014. Retrieved 1 April 2015. ^ "en/News/middle-east/2014/08/13/ISIS-militants-seize-more-territory-in-Syria-". english.alarabiya.net. Retrieved 21 October 2015. ^ "Islamic militants crush tribal uprising in Syria". Indian Monitor. Washington Post. 11 August 2014. Archived from the original on 26 June 2015. Retrieved 7 June 2015. ^ "Aleppo province: a man was killed with... – Syrian Observatory for Human Rights – Facebook". Retrieved 2 October 2014. ^ "World – News – msn". MSN. Retrieved 2 October 2014. ^ Kansa International. "Kurdish and Syrian News Agency". Retrieved 2 October 2014. ^ "IS Killed More than 700 Syria Tribe Members in 2 Weeks". Naharnet. Retrieved 2 October 2014. ^ "Lebanon's Hezbollah kills top jihadist in Syria: NGO". Yahoo News. 19 August 2014. Retrieved 2 October 2014. ^ "ISIL commander 'Abu Abdullah al-Iraqi' killed in Syrian army operation: report". 19 August 2014. Retrieved 2 October 2014. ^ "Hezbollah kills suicide bombing plotter: activists". The Daily Star Newspaper – Lebanon. Retrieved 2 October 2014. ^ "Breaking News from Tabqa Airbase: Syrian Army No Longer Encircled". Al-Masdar News. Retrieved 2 October 2014. ^ a b "Syrian army repels Islamic State attack". Retrieved 2 October 2014. ^ "Third ISIL Attempt to Seize Tabaqa Airport Fails". Retrieved 2 October 2014. ^ AFP. "ISIS begins push to seize Syrian air base". Retrieved 2 October 2014. ^ Toby Helm. "US 'set to launch air strikes' on senior Isis terror chiefs in Syria – World news – The Observer". the Guardian. Retrieved 2 October 2014. ^ Cockburn, Patrick (20 February 2016). "Turkish threats of intervention after Ankara bombing taken seriously by Obama". independent.co.uk. Retrieved 21 February 2016. ^ Butler, Daren (17 February 2016). "Kurds' advance in Syria divides U.S. and Turkey as Russia bombs". Reuters. Retrieved 21 February 2016. ^ "Jihadists seize Syria's Tabqa airport after fierce battle". Channel NewsAsia. Archived from the original on 26 August 2014. Retrieved 2 October 2014. ^ "More than 500 dead in battle for Syria's Tabqa airport: NGO". The Citizen. Archived from the original on 26 August 2014. Retrieved 25 October 2014. ^ Saul, Heather (28 August 2014). "YouTube video posted by Isis militants shows 'execution of 250 Syrian soldiers'". Independent. London. Retrieved 29 August 2014. ^ "Syria war planes hit jihadist sites in Deir Ezzor". Zee News. Retrieved 2 October 2014. ^ "Syria Warplanes Strike ISIL Sites in Deir Ezour, Army Operates across Country". Retrieved 2 October 2014. ^ "U.S. airstrikes hit ISIS targets inside Syria – CNN.com". CNN. 23 September 2014. Retrieved 2 October 2014. ^ "US, Arab allies launch first wave of strikes in Syria". Fox News. 23 September 2014. Retrieved 2 October 2014. ^ Abi-Habib, Maria (23 September 2014). "Syria Rebels Say They Were Told of Airstrikes Against Islamic State". WSJ. Retrieved 2 October 2014. ^ "Syria Daily, Sept 23: US Airstrikes & Missiles Hit Islamic State". EA WorldView. Retrieved 2 October 2014. ^ "Erdogan asks UN for no-fly zone over Syria". Retrieved 2 October 2014. ^ "IDF shoots down Syrian fighter plane infiltrating Israeli territory". Haaretz.com. 23 September 2014. Retrieved 2 October 2014. ^ "BBC News – Islamic State steps up attack on Syrian town of Kobane". BBC News. 4 October 2014. Retrieved 14 October 2014. ^ "Syria destroys two warplanes used by ISIS to train fighter pilots". Mail Online. London. 22 October 2014. Retrieved 23 October 2014. ^ "BBC News – Syria conflict: '200 air force strikes' in 36 hours". BBC News. 22 October 2014. Retrieved 23 October 2014. ^ Oliver Holmes (22 October 2014). "Syria says shoots down two of three Islamic State jets". Reuters. Retrieved 26 October 2014. ^ "Syrian Kurds 'drive Islamic State out of Kobane'". BBC News. 26 January 2015. Retrieved 26 January 2015. ^ sohranas. "YPG retakes the entire city of Ayn al- Arab "Kobani" after 112 days of clashes with IS militants". Syrian Observatory For Human Rights. Archived from the original on 16 October 2015. Retrieved 27 January 2015. ^ Zargham, Mohammad (31 January 2015). "U.S. general says Syrian town of Kobani taken from Islamic State". Reuters. Retrieved 31 January 2015. ^ "ISIS admits Kobani defeat after U.S.-led airstrike campaign in Syria". CTV News. Associated Press. 31 January 2015. Retrieved 31 January 2015. Members of the Islamic State group have acknowledged for the first time that they were defeated in the Syrian town of Kobani. ^ "Syria opposition forces claim regime attack in Daraa futile". Al Monitor. Archived from the original on 21 February 2015. Retrieved 20 February 2015. ^ sohranas. "26 members of the regime forces and allied militiamen killed today". Syrian Observatory For Human Rights. Archived from the original on 15 September 2015. Retrieved 4 March 2015. ^ "Elijah J. Magnier on Twitter". Twitter. Retrieved 4 March 2015. ^ The Christian Science Monitor. "Syrian rebels' march on Damascus becomes fight for their survival (+video)". The Christian Science Monitor. Retrieved 15 April 2015. ^ Blanford, Nicholas (21 August 2015). "Can Syria's Assad withstand latest battlefield setbacks? (+video)". Christian Science Monitor. Retrieved 22 April 2015. The regime's recent setbacks in Idlib and the south are due in part to Assad's regional enemies – including Saudi Arabia, Turkey, Qatar, and Jordan – agreeing on the need to unite rebel factions to oust Assad, according to analysts and regional diplomats. ^ "US-backed forces in Syria suffer big setback". 1 November 2014. Archived from the original on 7 December 2014. Retrieved 3 November 2014. ^ Sly, Liz (2 November 2014). "U.S.-backed Syria rebels routed by fighters linked to al-Qaeda". The Washington Post. Retrieved 3 November 2014. ^ Gibbons-Neff, Thomas (15 December 2014). "Al-Qaeda faction in Syria claims to have U.S.-supplied anti-tank weapon". The Washington Post. Retrieved 3 June 2015. The fielding of a TOW system would not necessarily provide al-Nusra with a capability it didn't already have. Similar weapons systems such as the Chinese HJ-8, French Milan and the Russian Spigot have all been seen in operation in Syria. ^ "Southern Syria rebels set collision course with al Qaeda". Reuters. 14 April 2015. ^ a b Lister, Charles (1 June 2015). "An Internal Struggle: Al Qaeda's Syrian Affiliate Is Grappling With Its Identity". Huffington Post. Retrieved 1 June 2015. But not all saw it the same way, especially when it came to the fighting against the SRF and Harakat Hazm. One FSA commander exclaimed to this author that "Jamal Maarouf was a criminal and his group was unpopular," while another such leader told this author in February 2015 that "Hazm's destruction cannot come soon enough, they have done nothing but cause trouble in Aleppo." [...] Having spoken extensively with leading commanders from across the Syrian spectrum in recent weeks, it is clear this [Army of Conquest] cooperation has at least partly been motivated by a desire to ensure victories in Idlib do not become strategic gains for al Qaeda. ^ al-Akla, Ahmad (8 May 2015). "After Syrian Army's Defeat, People Trickle Back to Idlib Towns". IWPR. Retrieved 29 May 2015. ^ "The Nusra Front's Game-Changing Rise in Syria". Carnegie Middle East Center. Retrieved 21 September 2015. ^ "Middle East – New Islamist alliance seizes Idlib from Syrian troops – France 24". France 24. ^ Blasting News. "New Islamist alliance captures Syrian regional capital Idlib from Ba'athist government forces". Blasting News. ^ "Thousands flee Syrian city Idlib after rebel capture". The Daily Telegraph. London. 29 March 2015. Retrieved 1 April 2015. ^ "As regional war rages, Syria's Assad faces setbacks". Reuters. 2 April 2015. ^ "Syria conflict: Islamists capture Jisr al-Shughur". BBC News. ^ sohranas. "After al- Mastomi town and its military camp, Al- Fateh Army expels the regime forces from Nihlaya". Syrian Observatory For Human Rights. Archived from the original on 22 May 2015. Retrieved 22 May 2015. ^ "Rebels take Ariha from Assad". The Daily Star Newspaper – Lebanon. ^ Erin Banco (19 June 2015). "In Syria's North, Opposition Is Making A Major Comeback Thanks To One Rebel Group, And To Turkey". International Business Times. ^ "Outside Powers Weigh Their Options in Syria". Stratfor. 6 June 2015. Archived from the original on 13 June 2015. Retrieved 6 June 2015. ^ "Hezbollah, Syrian army make big gains in border battle". Reuters. 13 May 2015. Retrieved 13 May 2015. ^ "ISIS is 'everywhere' in Syria's ancient city of Palmyra". CNN. 21 May 2015. ^ "IS overruns parts of Unesco-listed Syrian city". Retrieved 20 May 2015. ^ sohranas. "Islamic State carries out its motto "lasting and explading" and seizes more than 50% of Syria". Syrian Observatory For Human Rights. Archived from the original on 22 May 2015. Retrieved 21 May 2015. ^ "Syrian air force targets captured Palmyra city – monitor". Reuters. 25 May 2015. ^ "ISIS purges Syria's Palmyra of Assad loyalists". The Times of India. AP. 23 May 2015. Archived from the original on 25 May 2015. Retrieved 23 May 2015. ^ "Syria regime launches 15 air raids around Palmyra". ^ Spencer, Richard (9 June 2015). "Assad's forces defeated on roads north and south". London: The Telegraph. Retrieved 10 June 2015. Meanwhile, Islamic State of Iraq and the Levant, attacked west from Palmyra, reached the town of Hassia on the main road north from Damascus to Homs and the coast. ^ "Islamic State Launches Two Attacks in Syria". Stratfor. 25 June 2015. Retrieved 25 June 2015. The Islamic State launched two attacks in northern Syria on June 25 [...] The second attack was directed against the parts of al-Hasaka city still occupied by forces loyal to Syrian President Bashar al Assad and Kurds in the northern part of town. The mainstream media has largely focused on the Kobanî attack, but the al-Hasaka operation in the northeast is more important by far. ^ "Islamic State attack in northeast Syria reported to displace 60,000 – UN". The Star Online. Reuters. 26 June 2015. Retrieved 26 June 2015. ^ "ISIS seize Qaryatain town in central Syria". 6 August 2015. Retrieved 9 September 2015. ^ "Australia launches first air strikes inside Syria – BBC News". bbc.com. Retrieved 21 October 2015. ^ a b "Russian missiles 'hit IS in Syria from Caspian Sea'". BBC News. 7 October 2015. ^ "The decision to use the Armed Forces of the Russian Federation abroad (Syria)" (in Russian). RIA Novosti. 30 September 2015. ^ "Russian military advisers work in Syria, longtime military cooperation 'no secret' – Moscow — RT News". rt.com. Retrieved 21 October 2015. ^ "US Confirms Russian Airstrikes in Syria", 30 September 2015. ^ Manal. "Syria's ambassador to Russia urges all countries to join Syria and Russia against terrorism". sana.sy. ^ "Syria conflict: Russia launches fresh strikes – BBC News". bbc.com. Retrieved 21 October 2015. ^ "Russians make air strikes on Islamic State, US-backed Syrian rebel targets | Stuff.co.nz". stuff.co.nz. Retrieved 21 October 2015. ^ "Obama authorizes resupply of Syrian opposition – CNNPolitics.com". edition.cnn.com. Retrieved 21 October 2015. ^ "Russian missiles 'hit IS in Syria from Caspian Sea'". BBC. 7 October 2015. ^ "Russia has ground troop battalion, advanced tanks in Syria: U.S. NATO envoy". Reuters. 7 October 2015. ^ "Syrian army, Russian jets drive back rebels in fiercest clashes for days: monitor". Reuters. 12 October 2015. ^ "Obama Administration Ends Pentagon Program to Train Syrian Rebels". The New York Times. 9 October 2015. Retrieved 9 October 2015. ^ a b "U.S. Weaponry Is Turning Syria Into Proxy War With Russia". The New York Times. 12 October 2015. Retrieved 14 October 2015. ^ "US axes $500m scheme to train Syrian rebels, says NYT". The Guardian. 9 October 2015. Retrieved 13 October 2015. ^ "Secret CIA effort in Syria faces large funding cut". The Washington Post. 10 June 2015. Retrieved 13 October 2015. ^ Lizzie Dearden (9 October 2015). "Iranian commander Brigadier General Hossein Hamedani killed by Isis while advising Syrian regime". The Independent. ^ "Iran's involvement in Syria carries growing costs – U.S. official: 'Psychological blow' in ISIS killing of Iranian general in Syria". edition.cnn.com. Retrieved 21 October 2015. ^ "Two more Iranian commanders killed in Syria". Al Jazeera. 13 September 2015. Retrieved 14 October 2015. ^ "Новости NEWSru.com :: Сирийская армия при поддержке российской авиации пошла в атаку на позиции повстанцев под Хомсом". newsru.com. Retrieved 21 October 2015. ^ "Syria and allies Iran and Russia prepare for Aleppo offensive | euronews, world news". euronews.com. Retrieved 21 October 2015. ^ "Syria's army, allies plan offensive against insurgents in Aleppo". Reuters. 14 October 2015. Retrieved 14 October 2015. ^ "Syrian Army, Hezbollah, Russian Air Force Coordinating for Aleppo Liberation Operation, FARS News Agency, 14–10–15". english.farsnews.com. Retrieved 21 October 2015. ^ "Syria conflict: Army launches new Aleppo offensive". BBC. 16 October 2015. Retrieved 17 October 2015. ^ "US signals shift in Syria-Iraq campaign against Islamic State". BBC. 28 October 2015. Retrieved 29 October 2015. ^ "Syria conflict: John Kerry seeks end to civil war 'hell'". BBC. 29 October 2015. Retrieved 29 October 2015. ^ "Syrian army enters Aleppo air base after Islamic State siege – state TV". Reuters. 10 November 2015. Retrieved 11 November 2015. ^ "TASS: Military & Defense – Russia involves strategic missile carriers in operation against Islamic State in Syria". TASS. ^ a b "Long-range bombers to fly anti-ISIS missions from Russia, Putin orders Navy to work with France". RT English. ^ "French jets bomb ISIS stronghold of Raqqa, Syria; few may have been killed". CNN. 16 November 2015. Retrieved 20 November 2015. ^ Путин поручил ВМФ РФ установить контакт с военно-морской группой Франции Interfax, 17 November 2015. ^ "Russia steps up attacks against IS with missile bombardment". BBC. 18 November 2015. Retrieved 19 November 2015. ^ "France to deploy largest warship in mission against IS". BBC. 5 November 2015. Retrieved 18 November 2015. ^ "France more active than rest of the west in tackling Syria". The Guardian. 18 November 2015. Retrieved 19 November 2015. ^ МИД РФ: удары Парижа по инфраструктуре Сирии не оправданы самообороной RIA Novosti, 20 November 2015. ^ «Если ничего не предпринимать, то террористическая угроза приобретет для нас еще более серьезные масштабы» Kommersant, 20 November 2015. ^ President al-Assad to French delegation: Terrorist attacks on Paris can’t be separated from those of Beirut and events in Syria Sana, 14 November 2015. ^ Hugh Naylor (14 November 2015). "Syria's President Assad says Paris attacks result from France's aiding of rebels". The Washington Post. Archived from the original on 7 January 2019. Retrieved 7 January 2019. ^ "Remarks by President Obama and Prime Minister Trudeau of Canada After Bilateral Meeting". The U.S. White House. 19 November 2015. Retrieved 20 November 2015. ^ "Obama says Syria settlement needed to eliminate Islamic State". Reuters. 18 November 2015. Retrieved 20 November 2015. ^ "Paris attacks: UN backs 'all necessary measures' against IS". BBC. 21 November 2015. Retrieved 21 November 2015. ^ "Security Council 'Unequivocally' Condemns ISIL Terrorist Attacks, Unanimously Adopting Text that Determines Extremist Group Poses 'Unprecedented' Threat". un.org. ^ "Cameron hails UN backing for action against Islamic State". BBC News. 21 November 2015. Archived from the original on 1 March 2017. Retrieved 20 December 2018. ^ "U.N. Security Council Unanimously Votes to Adopt France's Counterterrorism Resolution". The Wall Street Journal. 20 November 2015. Retrieved 21 November 2015. ^ "Security council unanimously calls on UN members to fight Isis". The Guardian. 21 November 2015. Retrieved 21 November 2015. ^ "Deadly 'Russian airstrike' hits market in Syria's Idlib". Al Jazeera. 29 November 2015. Retrieved 29 November 2015. ^ "Российская авиация в Сирии разбомбила овощной рынок: минимум 40 погибших". NEWSru. 29 November 2015. Retrieved 29 November 2015. ^ "MPs approve motion on ISIL in Syria". UK Parliament. 2 December 2015. Retrieved 5 December 2015. ^ "Syria air strikes: What you need to know". BBC. 3 December 2015. Retrieved 12 December 2015. ^ "Syria air strikes: RAF Tornado jets carry out bombing". BBC. 3 December 2015. Retrieved 3 December 2015. ^ a b "Syria conflict: Coalition denies air strike on army camp". BBC. 7 December 2015. Retrieved 7 December 2015. ^ "Syria calls US-led coalition air strike on Assad regime forces an 'act of aggression'". The Independent. 7 December 2015. Retrieved 7 December 2015. ^ "Pentagon says Russian — not American — warplanes hit a Syrian army base". The Washington Post. 7 December 2015. Retrieved 9 December 2015. ^ "Washington denies U.S.-led coalition hit Syria army camp". Reuters. 8 December 2015. Retrieved 9 December 2015. ^ "4 US-led coalition jets seen over Deir ez Zor in Syria day govt troops attacked – Russian MoD". RT. 7 December 2015. Retrieved 9 December 2015. ^ Михаил Алаеддин (14 December 2015). "Источник: сирийская армия вернула контроль над авиабазой близ Дамаска". RIA Novosti. Retrieved 14 December 2015. ^ Balanche, 2006, p. 88. ^ "Syria army fully captures rebel redoubt in Latakia". Al arabia. 12 January 2016. Retrieved 14 January 2016. ^ h.said. "Syrian Army establishes control over four villages near Salma in Lattakia and another in Aleppo". ^ "Isis massacre: At least 300 killed, several held hostages in east Syria". International Business Times. 17 January 2016. ^ "Dozens killed by Islamic State in 'massacre' in Syrian city of Deir ez-Zor". The Guardian. 17 January 2016. ^ "Russians survey new airbase on Syria-Turkey border, US officials concerned". Fox News Channel. 21 January 2016. Retrieved 23 January 2016. ^ "Россия и США синхронно создают новые авиабазы на севере Сирии". NEWSru. 23 January 2016. Retrieved 23 January 2016. ^ a b "U.S. officials: Russia looking at Syria airfield near Turkey". CNN. 22 January 2016. Retrieved 23 January 2016. ^ "US 'takes control' of Rmeilan airfield in Syria". ^ a b "Syria conflict: Major rebel town 'seized' in boost for Assad". BBC. 24 January 2016. Retrieved 24 January 2016. ^ Syria regime advances in northwest ahead of peace talks AFP, 24 Dec 2016. ^ Barry Temmo. "Update 4-Army establishes full control over al-Sheikh Miskeen in Daraa and a village in Aleppo". ^ Syrian army seizes strategic town in Deraa province: monitor Reuters, 25 January 2016. ^ Tide turns in Syrian war with capture of key town Al Jazeera, 26 December 2016. ^ "Temporary truce comes into effect". BBC News. 26 February 2016. "Joint Statement of the United States and the Russian Federation, as Co-Chairs of the ISSG, on Cessation of Hostilities in Syria". U.S. Department of State. 22 February 2016. Archived from the original on 15 July 2016. Retrieved 25 July 2018. ^ "U.N. demands Syria parties halt fighting, peace talks set for March 7". Reuters. 26 February 2016. ^ A Potential Cease-Fire in Syria. The Atlantic. Published 22 February 2016. Retrieved 3 March 2016. ^ Landmark Syria ceasefire begins, with terrorist groups excluded. Scroll.in. Published 27 February 2016. Retrieved 3 March 2016. ^ "Syria conflict: UN steps up aid deliveries as truce holds". BBC News. 29 February 2016. ^ "Syrian army, with Russian air support, advances inside Palmyra". Reuters. 26 March 2016. ^ "Syrian army, rebels agree to 72-hour Eid truce, but fighting continues". Reuters. 7 July 2016. ^ "Syrian Civil War Map / Live Map of the Syrian Civil War". Syrian Civil War Map. Retrieved 17 August 2016. ^ Ali, Idrees. "Coalition jets scrambled to defend U.S. forces from Syrian bombing". Reuters UK. Retrieved 8 January 2017. ^ "Syria: YPG launches assault to take all of Hasaka". ^ Syria Kurds win battle with government, Turkey mobilises against them reuters, 24 August 2016. ^ "Erdogan says Syria operation aimed at IS jihadists, Kurdish PYD". 24 August 2016. Archived from the original on 25 August 2016. ^ a b Syria Jarablus: Turkish tanks roll into northern Syria BBC. 24 August 2016. ^ Turkey sends tanks into Syria in operation aimed at Isis and Kurds The Guardian, 24 August 2016. ^ Syria condemns Turkey’s breach of Syria’s sovereignty in Jarablos Sana, 24 August 2016. ^ "MIDEAST – Erdoğan to PYD: Those issuing threats should think about what will happen". ^ "Biden orders Syrian Kurds to pull back; Assad govt slams Turkish incursion". 24 August 2016. ^ Байден назвал условия, при которых США будут поддерживать курдов RIA Novosti. ^ Turkish forces deepen push into Syria, draw U.S. rebuke over their target Reuters, 29 August 2016. ^ "Turkish-backed Syrian rebels advance towards Manbij". www.aljazeera.com. Retrieved 15 July 2017. ^ Babb, Carla. "Carter Calls on Turkey to 'Stay Focused' on Islamic State". Retrieved 15 July 2017. ^ "US' comments about Turkey's targets in Syria unacceptable, says Turkish MFA". Daily Sabah. 30 August 2016. Retrieved 31 August 2016. ^ "Syria war: Turkey hits out at US over Kurds comments". BBC. 31 August 2016. ^ "Syrian Army uses ceasefire". BBC World News. 12 September 2016. Retrieved 12 September 2016. ^ "UN security council to hold emergency meeting on US air strikes in Syria". The Guardian. 17 September 2016. Retrieved 8 October 2016. ^ Julian Borger (20 September 2016). "US blames Russia after UN aid convoy in Syria targeted by air attack". The Guardian. Retrieved 15 October 2016. ^ "Aleppo aerial campaign deliberately targeted hospitals and humanitarian convoy amounting to war crimes, while armed groups' indiscriminate shelling terrorised civilians – UN Commission". Office of the High Commissioner on Human Rights. 1 March 2017. Archived from the original on 3 December 2018. Retrieved 8 January 2019. ^ "Syria conflict: Army declares offensive in eastern Aleppo". BBC World News. 23 September 2016. Retrieved 12 September 2016. ^ "Recapture of Aleppo: What next for Syria?". BBC World News. 15 December 2016. Retrieved 15 December 2016. "Russia: Syria establishes control over eastern Aleppo". CNN. 15 December 2016. Retrieved 8 January 2019. ^ NICHOLS, HANS; BRUTON, F. BRINLEY (26 October 2016). "Raqqa Offensive Against ISIS to Begin Within Weeks: Ash Carter". NBC News. Retrieved 26 October 2016. ^ Nichols, Hans; Burton, F. BRrinley (26 October 2016). "Raqqa Offensive Against ISIS to Begin Within Weeks: Ash Carter". NBC News. Retrieved 26 October 2016. ^ "'Wrath on the Euphrates' as US-backed forces launch operation to seize Raqqa from Isil's grip". The Telegraph. Retrieved 8 January 2017. ^ DuVall, Eric (3 December 2016). "Assad's forces retake half of rebel-held Aleppo". United Press International. Staff writer(s) (3 December 2016). "Aleppo siege: Syria rebels lose 50% of territory". BBC. ^ "Syria conflict: Ceasefire agreed, backed by Russia and Turkey". BBC World News. 29 December 2016. Retrieved 29 December 2016. ^ "Russia, Turkey broker 'nationwide' ceasefire deal". Al Jazeera. 30 December 2016. Retrieved 30 December 2016. ^ Zeina, Karam (3 January 2017). "Syria rebels suspend talks over alleged truce violations". Associated Press. Retrieved 3 January 2017. ^ "The Syrian flag is raised in Al-Feja Spring". SOHR. 28 January 2017. Retrieved 28 January 2017. ^ "Syrian army captures Wadi Barada". Al Jazeera. 29 January 2017. Retrieved 29 January 2017. ^ "Cease-fire frays in Syria's south as rebels launch new offensive". The Washington Post. ^ "Syria's warring sides brought together for Geneva talks". BBC News. 23 February 2017. Srivastava, Mehul; Solomon, Erika (23 February 2017). "Turkey recaptures strategic Syrian town of al-Bab from Isis". Financial Times. Retrieved 23 February 2017. ^ Ian Deitch (17 March 2017). "Syria fires missiles at Israeli jets after airstrikes". Yahoo! News. Associated Press. ^ "Russia and U.S. air strikes caused mass civilian deaths in Syria: U.N." Reuters. 6 March 2018. Retrieved 23 April 2018. ^ "Syria conflict: 'Deal reached' for four besieged areas". BBC News. 29 March 2017. ^ "Syria war: Why was Shayrat airbase bombed?". BBC News. 7 April 2017. ^ "U.S. strikes Syria; Trump fires 59 missiles in 'vital national security interest'". United Press Int'l. 7 April 2017. "Syria war: US launches missile strikes following chemical 'attack'". BBC News. 7 April 2017. US strikes on Syrian base: what we know – AFP. Retrieved 8 April 2017. ^ "Was Trump's Syria Strike Illegal? Explaining Presidential War Powers". The New York Times. 8 April 2017. ^ Putin calls US strikes against Syria 'aggression against sovereign country' TASS, 7 April 2017. ^ "SC/12783 7 APRIL 2017". United Nations News. 7 April 2017. ^ "Syria, Russia condemn US-led strike on pro-Assad forces". Al Jazeera. ^ "Syria army reaches Iraq border after US tensions: monitor". Al-Monitor. 9 June 2017. ^ "Government forces advance against rebels north of Hama". Al Jazeera. 23 April 2017. ^ "Jihadist counter-assault to retake Taybat Al-Imam ends in failure". Al-Masdar News. Archived from the original on 21 October 2017. Retrieved 20 December 2018. ^ "Four towns, one agreement and the 'same tragedy for all': Buses arrive ahead of mass evacuations". Syria Direct. 13 April 2017. ^ "Syria war: Huge bomb kills dozens of evacuees in Syria". BBC News. 15 April 2017. Retrieved 15 April 2017. ^ Isabel Coles; John Davison (25 April 2017). "Turkish jets strike Kurdish fighters in Syria, Iraq's Sinjar". Reuters. ^ Anne Barnard and Rick Gladstone (4 May 2017). "Russia Reaches Deal for Syria Safe Zones, but Some Rebels Scoff". The New York Times. ^ Gardiner, Harris (7 July 2017). "U.S., Russia and Jordan Reach Deal for Cease-Fire in Part of Syria". The New York Times. Retrieved 25 July 2017. ^ Trump ends CIA arms support for anti-Assad Syria rebels: U.S. officials Reuters, 19 July 2017. Jaffe, Greg; Entous, Adam (20 July 2017). "Trump halts covert arming of Syria rebels, a move likely to please Russia". The Washington Post. Retrieved 20 July 2017. ^ Сирийская армия деблокировала Дейр-эз-Зор, сообщили в Минобороны РФ NEWSru, 5 September 2017. ^ "Syrian army breaks three-year siege of Deir ez-Zor". Teletrader. ^ Syrian army breaks Isis' three-year-long siege of Deir Ezzor: Liberating the city will mean relief for its 70,000 residents as Isis, feeling the pressure, begins to conscript female fighters. The Independent, 5 September 2017. ^ Foreign Ministry: Raqqa still occupied, can only be considered liberated when Syrian Army enters it SANA, 29 October 2017. ^ "Isis dealt twin blows with loss of Deir ez-Zor and key Iraq border post". The Guardian. 3 November 2017. ^ Syrian army, allies, take last IS stronghold in Syria: commander, Reuters, 8 November 2017. ^ Putin declares "complete victory" on both banks of Euphrates in Syria Reuters, 6 December 2017. ^ Putin announces Russian troop withdrawal from Syria during visit BBC. ^ Владимир Путин посетил авиабазу Хмеймим в Сирии kremlin.ru, 11 December 2017. ^ Vladimir Putin announces Russian withdrawal from Syria during visit to airbase The Telegraph, 11 December 2017. ^ Россия начала формировать постоянную группировку в Тартусе и Хмеймиме TASS, 26 December 2017. ^ "Russia establishing permanent presence at its Syria bases: RIA". Reuters. 26 December 2017. ^ Лавров потребовал от американцев покинуть Сирию Rossiyskaya Gazeta, 28 December 2017. ^ Lavrov: US forces must leave Syrian territory completely Syrian Arab News Agency, 28 December 2017. ^ "Turkish field op against Afrin Kurds 'de facto underway' – Erdogan". Russia: RT. ^ Mustafa Aydın. Public support for cross-border operations Hürriyet Daily News, 1 February 2018. ^ "Israel F16 fighter jet shot down by Syrian air defence after targeting 'Iranian drone' in the war-torn country". The Sun. The United Kingdom. ^ "Israeli F-16 fighter jet crashes under Syrian anti-aircraft fire amid IDF cross-border raid". Russia: RT. ^ "Syria's Ghouta residents 'wait to die' as more bombs fall". Reuters. 21 February 2018. Retrieved 22 February 2018. ^ "Pro-Turkish forces pillage Afrin after taking Syrian city". Yahoo! News. Agence France-Presse. 18 March 2018. Retrieved 18 March 2018. ^ "Afrin: Turkey's President Erdogan threatens to expand military offensive beyond Kurdish town". Australian Broadcasting Corporation. 20 March 2018. Archived from the original on 1 May 2018. Retrieved 20 December 2018. ^ "Syrian rebel victory in Afrin reveals strength of Turkish-backed force". The Guardian. 22 March 2018. Archived from the original on 16 December 2018. Retrieved 20 December 2018. ^ Collard, Rebecca (19 March 2018). "Turkish forces take Syrian town of Afrin from Kurds". Beirut. Retrieved 20 December 2018. ^ Adu, Aletha (12 April 2018). "Syria chemical attack that killed 70 DID use nerve agent, blood and urine samples reveal". The Sun. Retrieved 22 April 2018. ^ "Syria attack: nerve agent experts race to smuggle bodies out of Douma". The Guardian. 12 April 2018. ^ Graham, Chris; Krol, Charlotte; Crilly, Rob; Ensor, Josie; Swinford, Steven; Riley-Smith, Ben; Emanuel, Louis (8 April 2018). "Russia blames Israel for attack on Syrian air base as pressure mounts over gas atrocity". The Daily Telegraph. Retrieved 9 April 2018. ^ "Douma chemical attack draws international outrage". Al Jazeera. Retrieved 9 April 2018. ^ Security Council fails to adopt three resolutions on chemical weapons use in Syria UN, 10 April 2018. ^ U.S., Russia clash at U.N. over chemical weapons attacks in Syria Reuters, 9 April 2018. ^ Russian officials warn of possible military clash with US over Syria The Guardian, 10 April 2018. ^ Россия нацелила "Калибры" на базы США в Сирии: Вооруженные силы РФ скрытно приведены в полную боеготовность Nezavisimaya Gazeta, 11 April 2018. ^ "America vows to respond to a suspected chemical attack in Syria". The Economist. 9 April 2018. Retrieved 10 April 2018. ^ Ensor, Josie (12 April 2018). "Syrian flag flying over onetime rebel stronghold Douma as Russians announce victory in Eastern Ghouta". The Telegraph. Retrieved 13 April 2018. ^ Kershner (10 May 2018). "Israeli Jets Hit Dozens of Iranian Targets in Syria". New York Times. ^ "Rebels in southern Syria reach deal to end violence". www.aljazeera.com. Retrieved 20 August 2018. ^ "Сирийская армия взяла под контроль главный пограничный переход с Иорданией". 6 July 2018. Retrieved 20 August 2018. ^ "In rare move, IDF admits Syria strike, expresses sorrow over Russian plane". The Times of israel. 18 September 2018. ^ Ensor, Josie; Luhn, Alec (18 September 2018). "Russia blames Israel for friendly fire attack on its aircraft by Syria which killed 15 servicemen" – via www.telegraph.co.uk. ^ Press, Jim Heintz, The Associated Press, Sarah El Deeb, The Associated (17 September 2018). "Russia, Turkey to create demilitarized zone for Syria's Idlib". ^ Israeli Air Force solely to blame for Il-20 crash – Russian Defense Ministry TASS, 23 September 2018. ^ "Russian Defence Ministry held a special briefing on curcumstances of the Russian Il-20 aircraft crash near the Syrian coast". Russian Defence Ministry. 23 September 2018. Retrieved 25 September 2018. ^ Syria to get Russia's S-300 air-defense missile system within two weeks TASS, 24 September 2018. ^ Гутенев: реакция Израиля на инцидент с Ил-20 вынудила РФ на поставки С-300 в Сирию: Председатель комиссии Госдумы по правовому обеспечению развития ОПК отметил, что теперь израильские летчики не смогут прятаться за российскими самолетами TASS, 24 September 2018. ^ Россия передаст Сирии С-300 в течение двух недель Kommersant, 24 September 2018. ^ "Syria to get Russia's S-300 air-defence missile system within two weeks". TASS. 24 September 2018. Retrieved 25 September 2018. ^ "Turkey will start operation east of Euphrates in Syria in a 'few days' – Breaking News – Jerusalem Post". www.jpost.com. REUTERS. ^ "Unilateral military action into northeast Syria 'unacceptable': Pentagon". Reuters. 12 December 2018. ^ "Turkey to clear Syria of both YPG, ISIL: Erdoğan". Hürriyet Daily News. 21 December 2018. ^ "Russia condemns 'Israeli' air strikes on Syria". BBC News. 26 December 2018. Archived from the original on 27 December 2018. Retrieved 27 December 2018. ^ "Syria war: Government forces 'enter Manbij' amid Turkey threats". BBC News. Archived from the original on 29 December 2018. Retrieved 29 December 2018. ^ Assad Authorizes Iraq to Attack ISIS in Syria , Haaretz, Dec 30, 2018. ^ Iraqi jets strike ISIS target in Syria a day after Damascus carte blanche, The National, Dec 31, 2018. ^ "Two British soldiers injured in Islamic State attack in Syria". BBC News. 6 January 2019. Archived from the original on 6 January 2019. ^ "Syria conflict: Bolton says US withdrawal is conditional". BBC News. 6 January 2019. Archived from the original on 6 January 2019. ^ "Syria conflict: Turkey says US plea on Kurds 'unacceptable'". BBC News. 9 January 2019. Archived from the original on 9 January 2019. Retrieved 9 January 2019. ^ "Two 'American IS fighters' captured by Syrian militia". BBC News. 7 January 2019. Archived from the original on 8 January 2019. Retrieved 8 January 2019. ^ "US to pull forces from Syria, continue fight against ISIL: Pompeo". Al Jazeera News. 11 January 2019. Archived from the original on 10 January 2019. Retrieved 11 January 2018. ^ "US to expel every last Iranian boot from Syria – Pompeo". BBC News. 10 January 2019. Archived from the original on 11 January 2019. Retrieved 11 January 2019. ^ "Syria war: 'IS suicide bomber' kills US troops in Manbij". BBC News. 16 January 2019. Archived from the original on 17 January 2019. Retrieved 17 January 2019. ^ "Islamic State group defeated as final territory lost, US-backed forces say". BBC News. 23 March 2019. Retrieved 24 April 2019. ^ "Syria war: IS 'kills 35' government troops in desert attacks". BBC News. 20 April 2019. Retrieved 24 April 2019.